In the past four and a half years we have been many great places and crossing destinations off of one’s “bucket list” is fun. It is sort of a game but it is not the only one we have played. For example, we made a game of boosting our Flickr "stats" to 1 million views of individual photos and I utilized a variety of ways to accomplish that; posting photos on Reddit and Flickr, etc and I'm happy to report that we were successful. 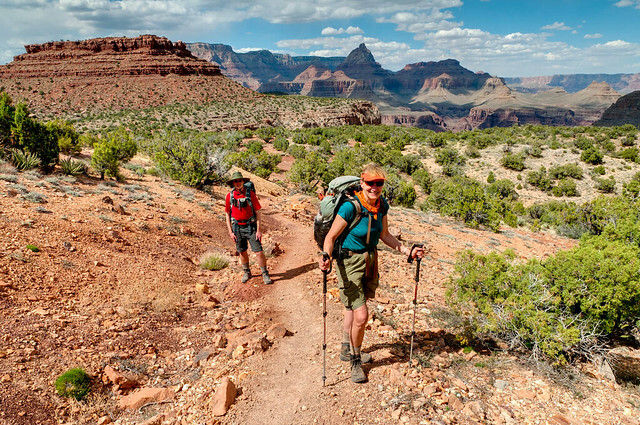 More recently we have become involved in a new and much more gratifying (albeit more challenging) game, hiking every trail within selected National Parks. 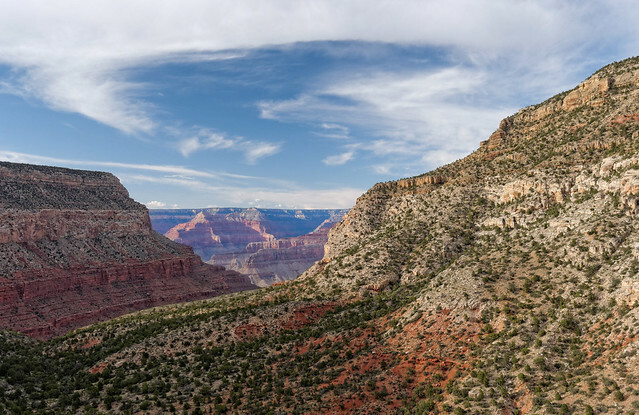 This post covers some of our progress in Grand Canyon National Park. 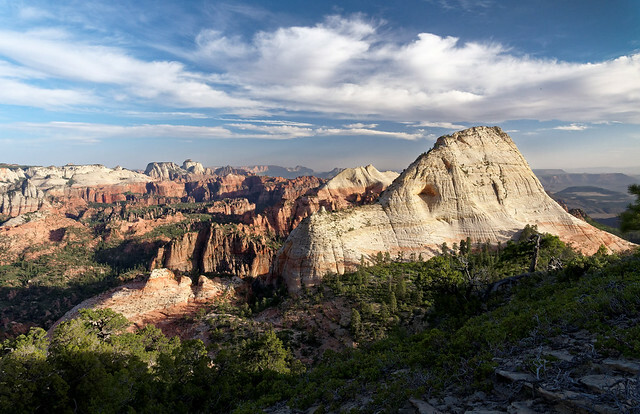 It also covers our success in Zion National Park. I don’t know how long we will be able to play this game but it will sure be fun while it lasts! 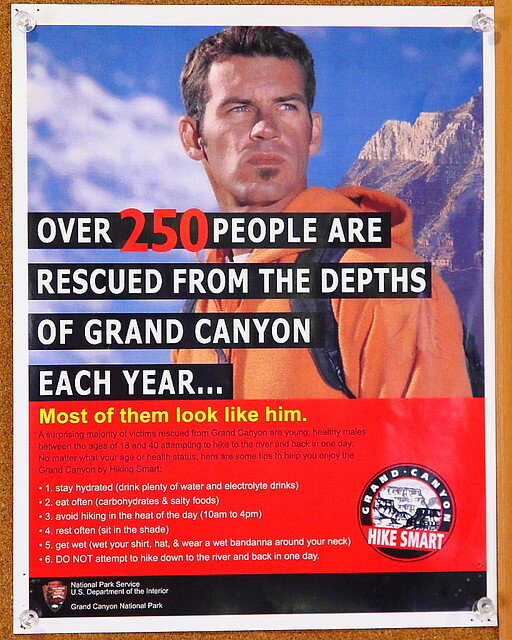 We realized something last spring after our backpacking adventures in Grand Canyon. 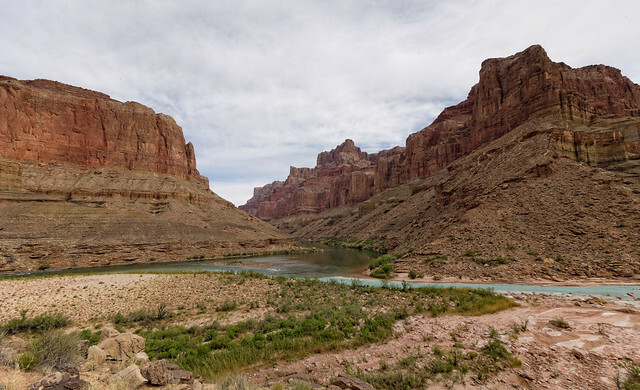 Between what we did in April 2013 and in May 2011 we were within striking distance of having hiked every trail within the park that was south of the Colorado River. So we went this past spring with that goal in mind. John figured out that we could do it with three backpack trips and a few dayhikes. 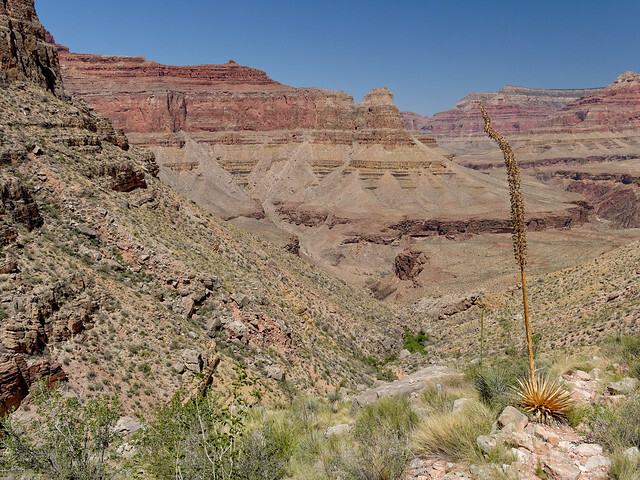 Our first backpack trip was 5 days/4 nights starting at the South Kaibab Trailhead and coming out at Grandview Point. The upper portion of this trail does not get sun on it during the winter so there could have been some snow still on the trail in early April. Fortunately we could see well enough from the rim that the trail was largely clear so we didn’t need to wear traction devices. 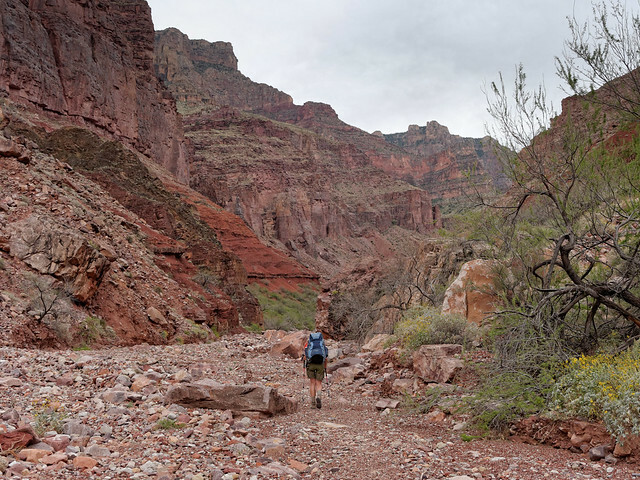 In our opinion the South Kaibab Trail is the best constructed of all trails in the park and the going down is easy. 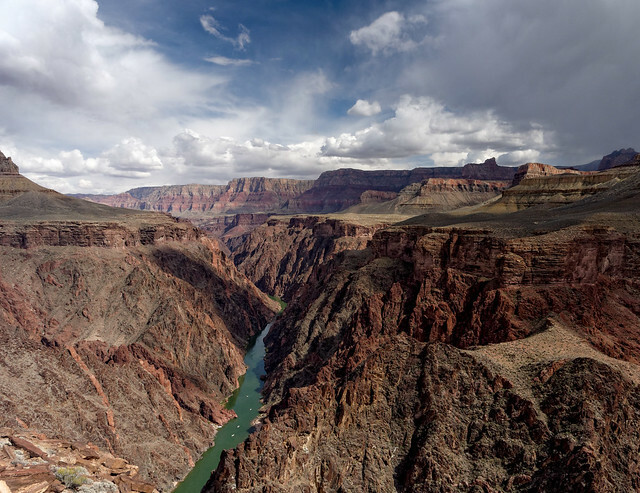 One does not have to travel far to begin to get expansive views of the canyon. 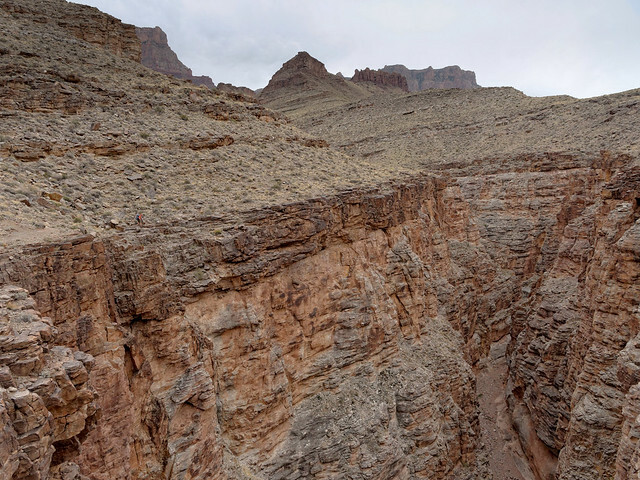 We dropped 3,260 feet in 4.3 miles before reaching the junction with the Tonto Trail at the “Tipoff”. We then headed east on the Tonto Trail. 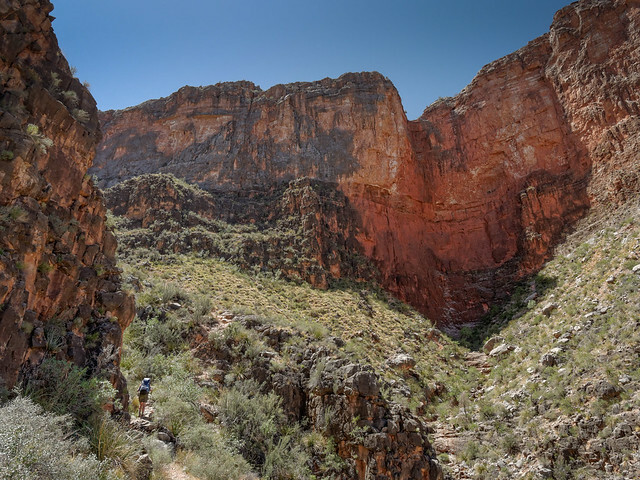 We think the Tonto Trail is under rated. 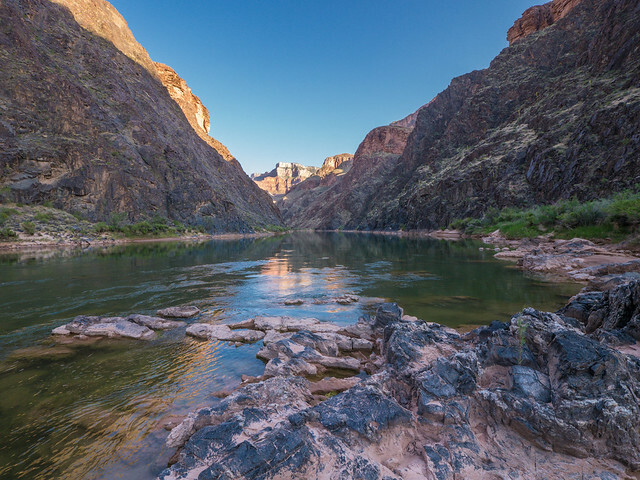 Hikers are frequently so focused on getting to the river they don’t take the time to enjoy the openness, the solitude and the views that are available both up to the South Rim and down to the river. 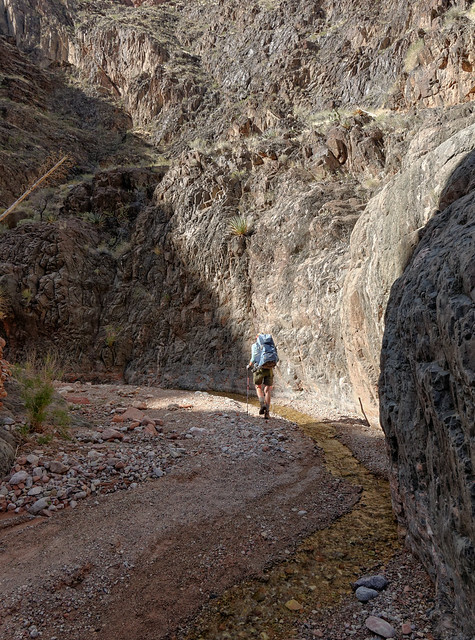 Once on the Tonto we had another 5.9 miles to go before reaching our destination for the day at Lonetree Canyon. 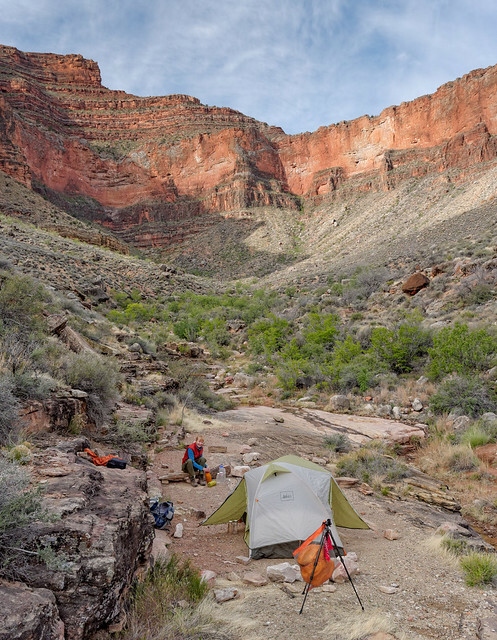 I always have a special feeling toward the first campsite of a trip. 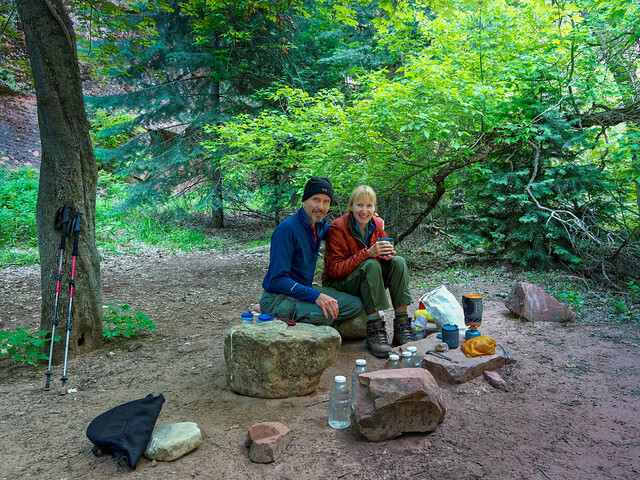 After the frenetic activity of packing for the trip, getting to the trailhead and then to our first campsite we thoroughly enjoy the opportunity to just relax and enjoy our surroundings. 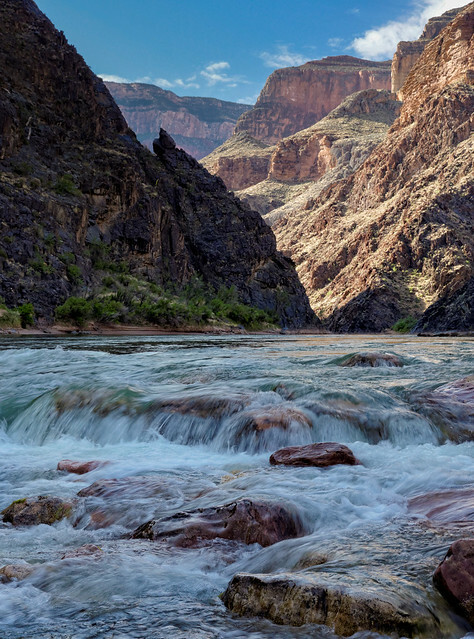 … as well as the Colorado River (if you look closely you can see boats on the river). … where we enjoyed another scenic and comfortable camp. 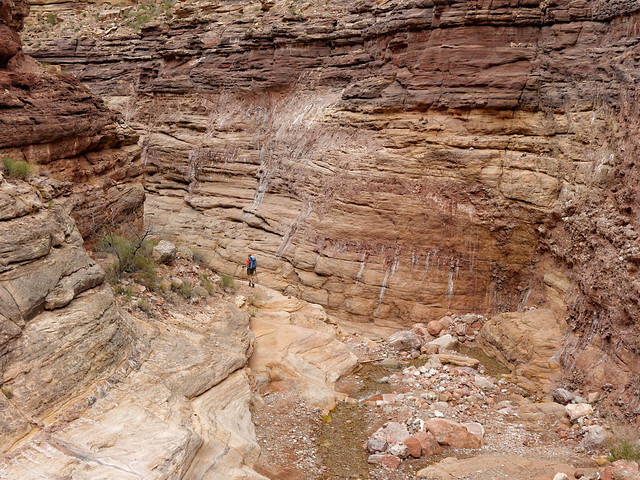 … and other times cutting in to circumvent the many side canyons that open into the main canyon. 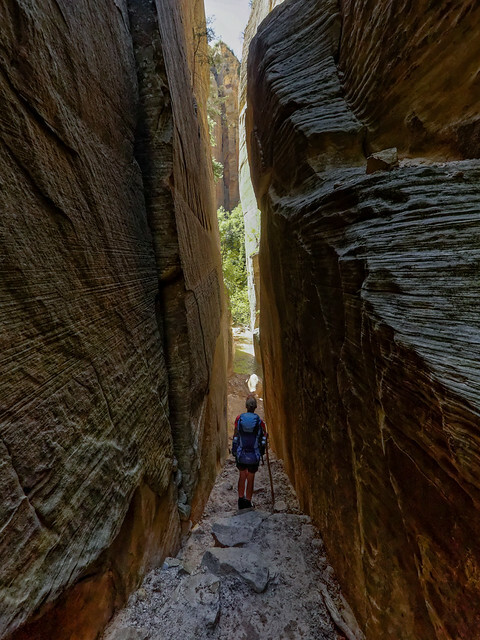 Some of these side canyons almost seem large enough to be parks in their own right but are largely ignored due to their relative diminutive size. We only had 5.5 miles to go to our next camp on Cottonwood Creek. 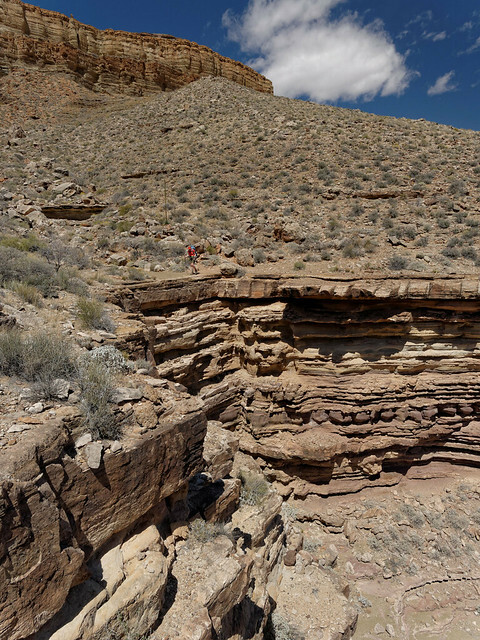 Our plan was to take the remainder of the day to explore Horseshoe Mesa. After we set up camp we headed up the sometimes very steep and loose trail from Cottonwood. We then hiked out to the end of the east arm of the mesa for great views. After that we retraced our steps to the junction and took the trail out to the end of the west arm. A feature we were not aware of at the time is the “Cave of the Domes”, the only cave within the park that can be entered without a permit. As I understand it the trail to this cave originates near the masonry structure. 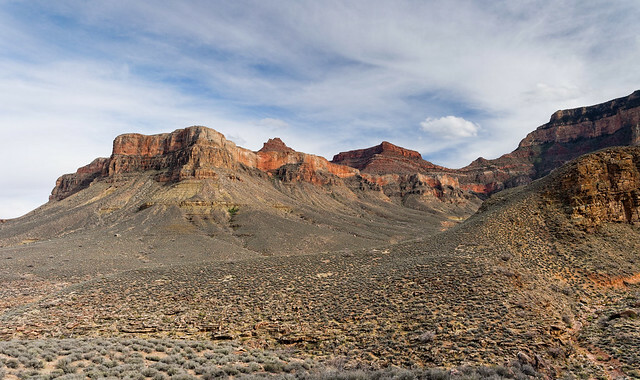 Perhaps in the future we will dayhike down to Horseshoe Mesa and check it out. 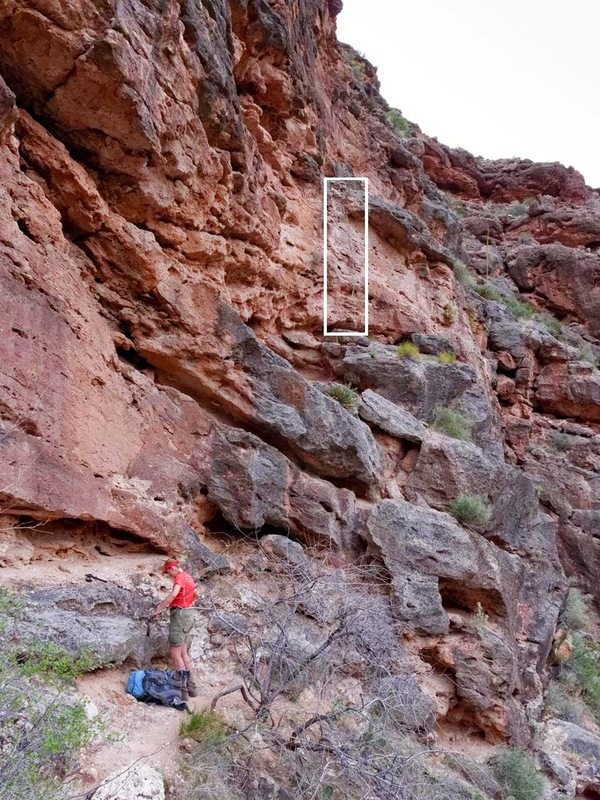 We had read that of the three ways off of Horseshoe Mesa that the easiest was a well established route that descends from the east side of the west arm. 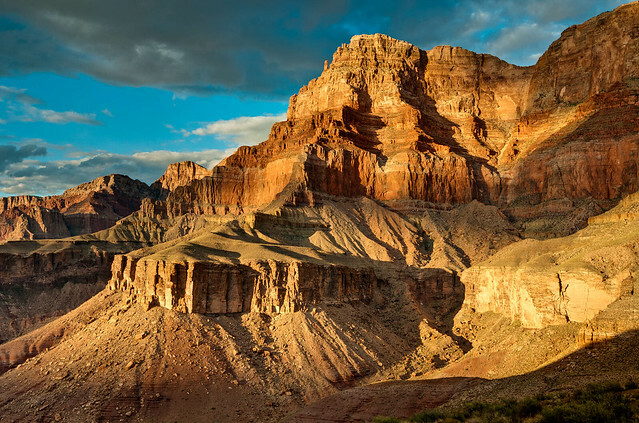 “Easy” in the Grand Canyon is a relative term. We have been up both of the other two ways and I would have found the steep loose parts challenging for my knees to go down so I was happy to give the “easier” way a try. It was loose but had more switchbacks. I got a head start while John stopped to take photos but was slow and cautious so John caught up with me without a problem. We then headed back to our camp at Cottonwood Creek. We did not have far to go that day, only to Hance Creek (which is reported to be 4.4 miles or 5.9 miles depending on where you look) so we spent the morning exploring down Cottonwood Creek. It did involve some down climbing. 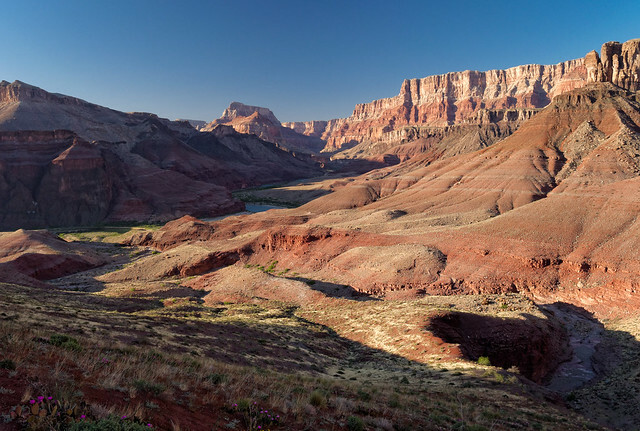 After photographing grand vistas John enjoyed working in the more intimate setting. 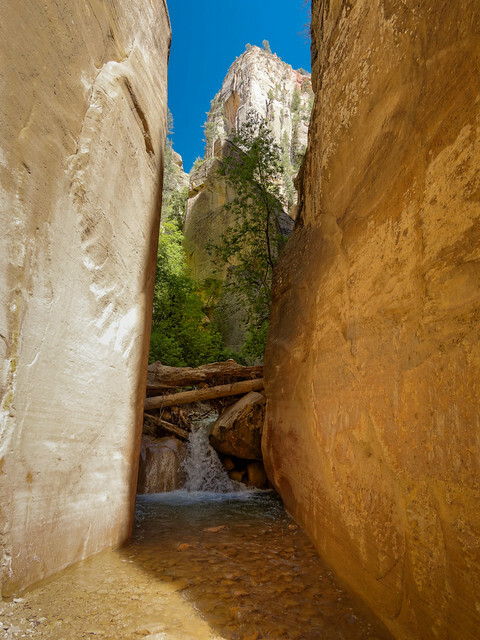 John frequently does some off trail exploring near our campsites looking for photo opportunities and this small canyon is a good example of the value of doing so. 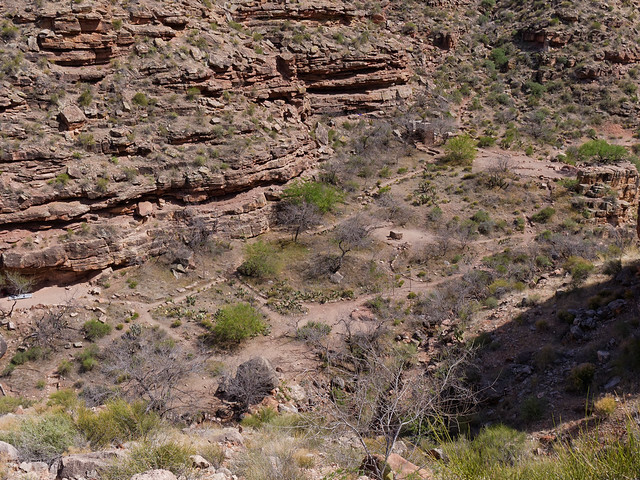 We then took the Tonto Trail around Horseshoe Mesa toward Hance Creek. 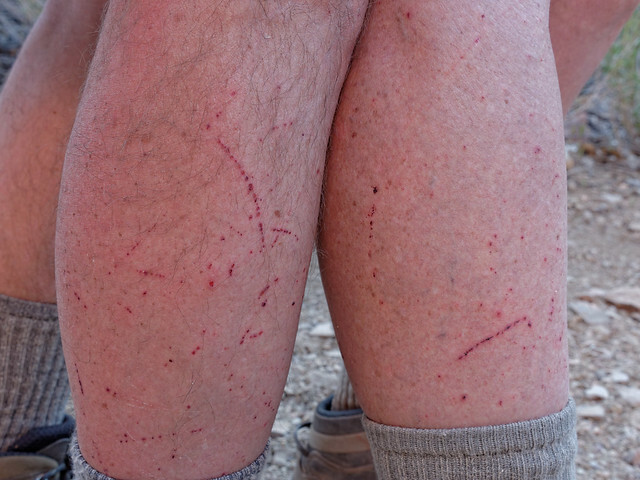 The Tonto Trail is not maintained and can be quite brushy in places so we both sported what is “affectionately” known as the “Tonto Tattoo”. We camped our last night on Hance Creek. The next morning we only had to go 4.9 miles up the Grandview Trail to complete the trip. It is not far but it was quite steep in places. I realized that I was not completely acclimated to the altitude and had to off load some weight to John. 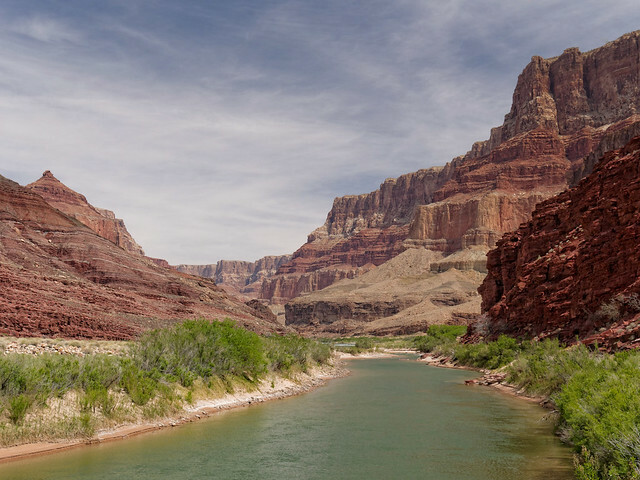 I worked at reassuring myself that I was in the process of adapting which was important as our next trips would require more effort including hiking all the way from the river to the rim in one day. All of our photos from this backpack trip are on Flickr. Our next trip was 7 days/6 nights starting on the Tanner Trail and coming out at the New Hance Trailhead. This is the second time we have been down the Tanner and I wasn’t really looking forward to it as it had been murder on my knees. But I suppose because I expected the worst I didn’t find it all that bad. 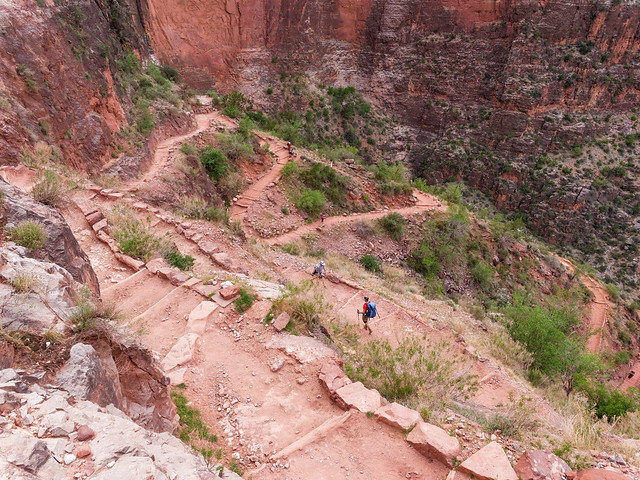 Sure, it was steep and loose in places but that is commonplace for any trail within the canyon beyond the “corridor” trails (Bright Angel, South Kaibab and North Kaibab). 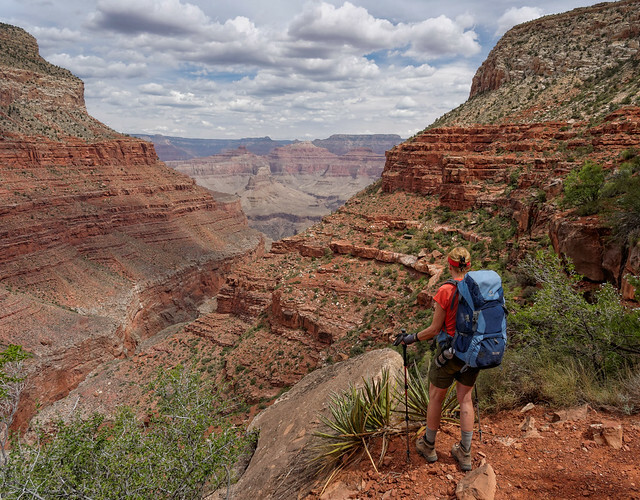 Once the trail drops some then you begin to get views into the canyon. It is also possible to look up and see the tower at “Desert View” (it made me a bit self conscious during “pee breaks” to think there could be a tourist with binoculars up there). The lower we got the better the views. Light levels and weather conditions can vary greatly from one trip to the next and this dramatically affects the quality of images. 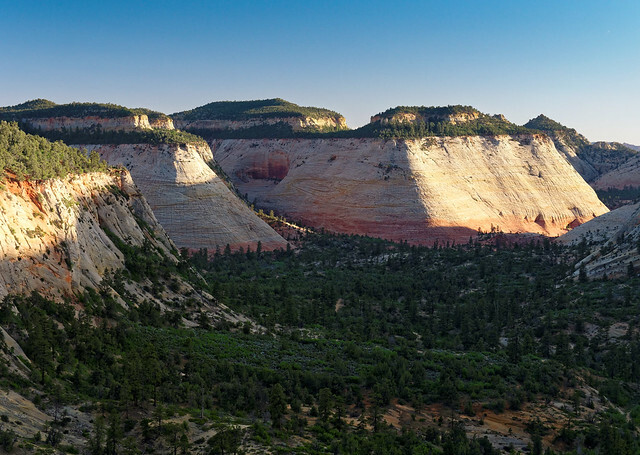 We had started early that day under a cloudless sky and the light was “flat” when we reached this spot, one of our favorite views from the Tanner Trail. However, when we did this trail in May 2011 we didn’t get started until noon and the weather was unsettled. The deepening evening light combined with the dynamic sky created a much more dramatic image. Part of the beauty of backpacking rather than dayhiking is it enables you to be in the right place at the right time (but a consequence of being in scenic places in the evening is that one does not always arrive at one's destination before dark which is what happened on that trip). … but I found myself remembering photos John had taken on the previous trip during what photographers refer to as the “Golden Hour” in the evening. 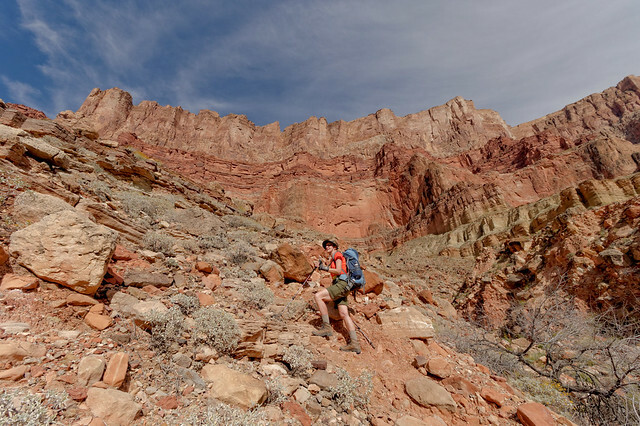 We were quite lucky to get such great photos our first time on this trail but there was no guarantee of that and there have certainly been other trips we have done where conditions were less than optimal. It just proves that there can be good reasons for revisiting scenic spots in order to see them under different conditions. Most of the lower portion of the trail is reasonably good although there are brief sections where it is a really good idea to pay close attention to where you put your feet. Depending on your source of information the Tanner Trail is either 7.8 miles or 9 miles. Our map has it at 7.8 miles which is what we are inclined to believe. Once we hit the junction with the Beamer Trail we headed east up the river for a short distance. ... once we reached the Palisades. Portions of the trail give the sense of exposure but it does provide great views down to the river (I’m barely visible on the cliff to the right in the photo below). The Beamer Trail is a total of 9.1 miles but our day was shorter than that as we had already covered a part of that and we would not go all the way to the end of it until the following day. Even so it still proved to be a long day. 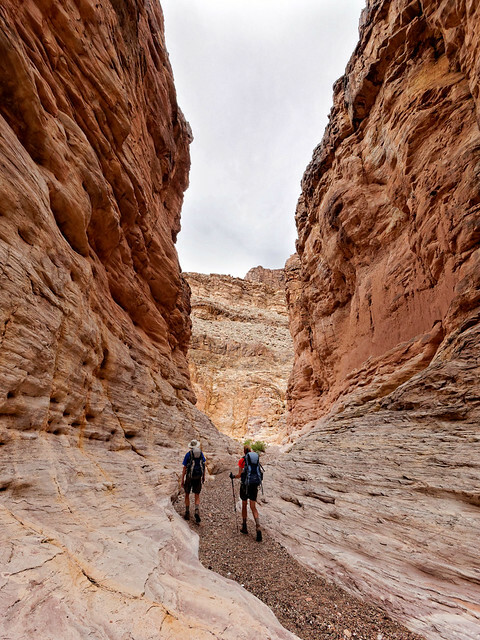 The Beamer Trail is similar to the Tonto Trail in that it encounters numerous side canyons. 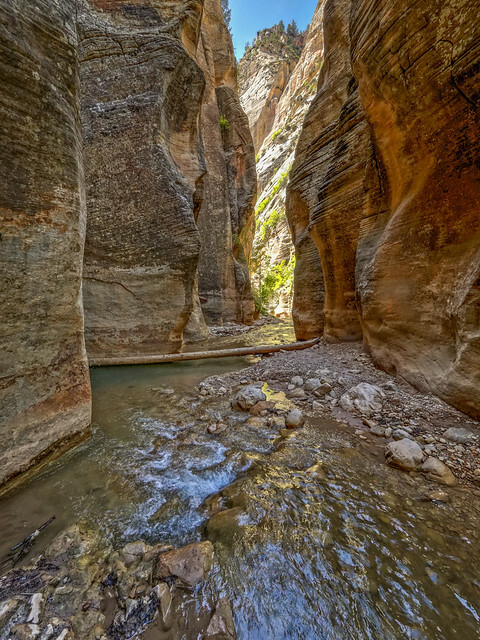 However, where the Tonto remains relatively level as it circumvents these side canyons the Beamer repeatedly drops down into them where it then climbs up and over huge rubble piles within the canyon. 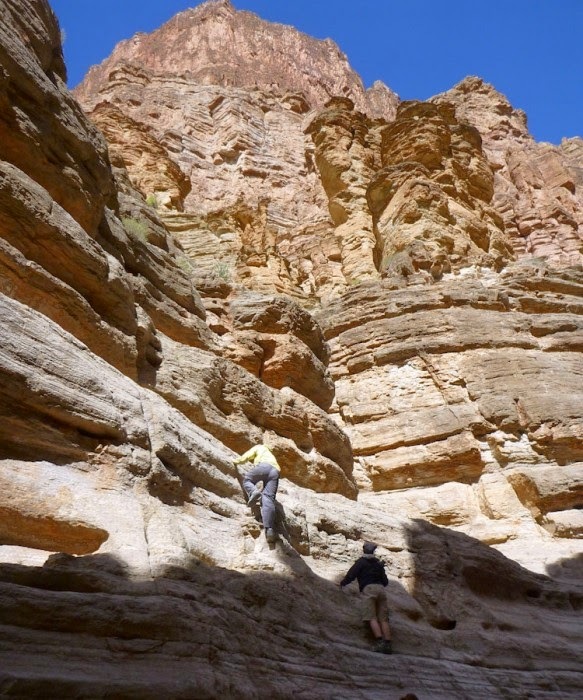 One must then drop back down before finally climbing out of the side canyon. It is not especially difficult but it is very time consuming. 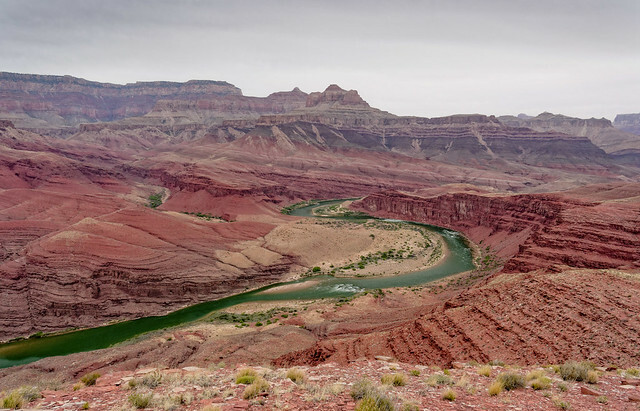 We were happy to finally see the confluence of the Colorado with the Little Colorado River in the distance as we then knew we didn’t have far to go. 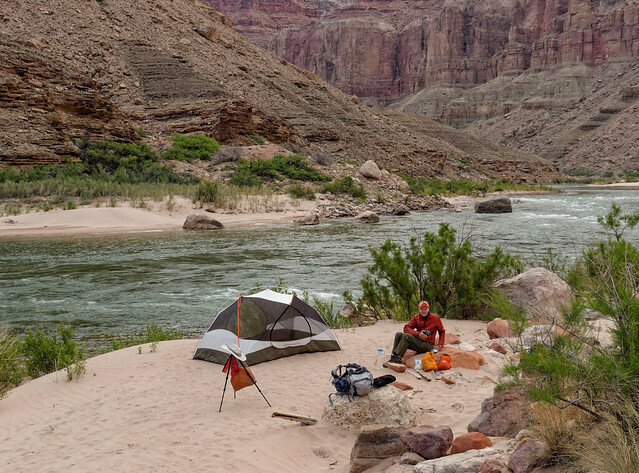 Camping is not permitted within 2 miles west of the confluence so we camped that night at the recommended site. The side trail to this site is well marked by a large cairn. We dayhiked to the confluence the next morning. 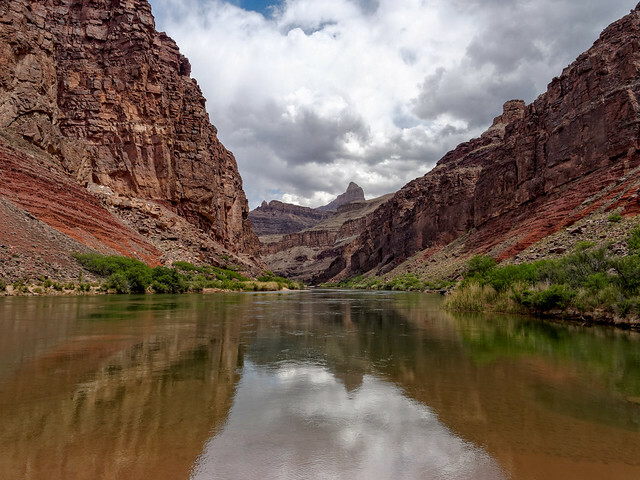 There is a fierce debate going between supporters of a proposal to develop the land on the far side of the Little Colorado River, which is Navajo tribal land, and those in favor of preserving the area. 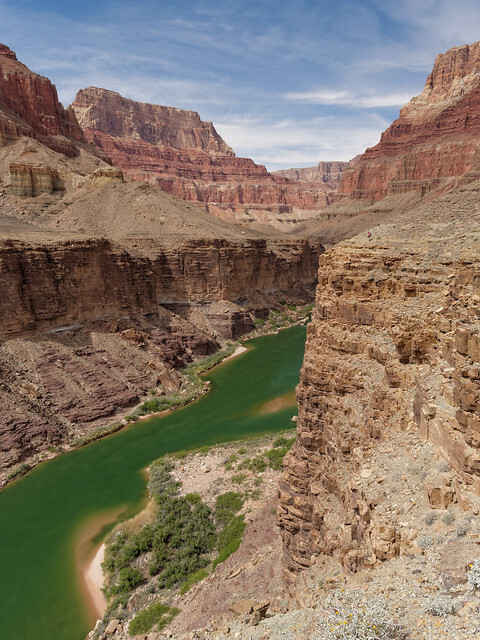 The proposal includes restaurants at the top, a gondola down to the bottom of the canyon and a walkway along the river. 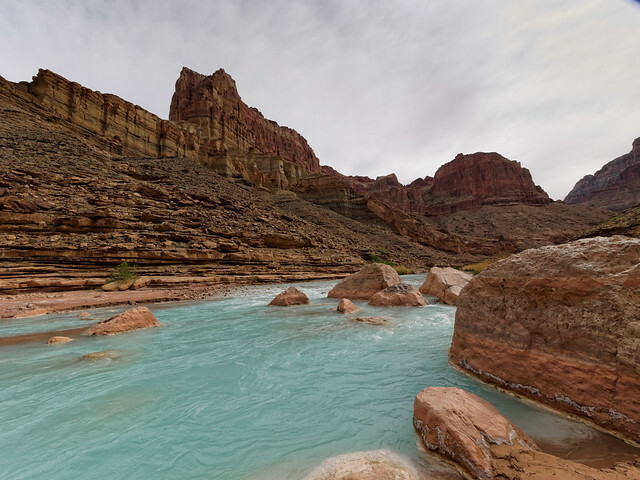 The Little Colorado River is a lovely but improbable light turquoise blue. It is reported to have a high mineral content and it is advised that one does not drink it. 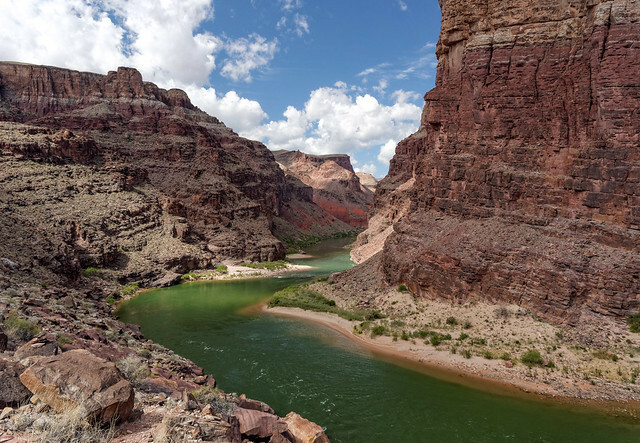 Instead backpackers are encouraged to obtain their water from the Colorado well below the confluence. A highlight of this trip is seeing the abandoned Beamer cabin. 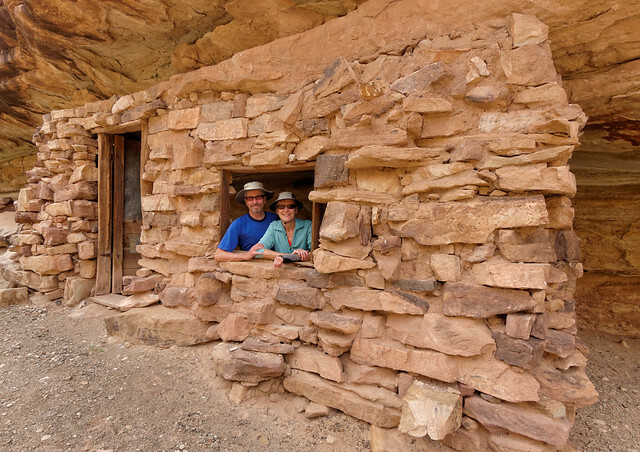 Ben Beamer was a miner and prospector back in the late 1890’s who remodeled an ancient Puebloan ruin to better suit his needs. He is responsible for the trail’s existence so it is fitting that it carries his name. Standing within the rustic shelter I couldn’t even imagine what it took for someone, be they miner or native American, to live and work in such harsh conditions. It is always a humbling experience to be confronted with reminders of how “soft” we Americans are these days. We then began the hike out. 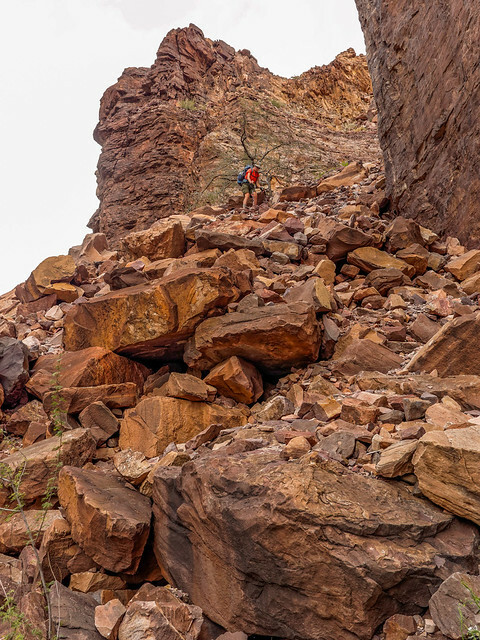 There was a portion of trail we had done the previous day that had made me very nervous due to the narrowness, the exposure and the sloped eroded surface. John remembered it as well. I wanted to be sure he took some photos of me on it and we both kept an eye out for it. We were quite surprised when the end of the Palisades came into view and we realized we had gotten past it without noticing. It ends up John had taken photographs of me hiking on it but at the time it didn’t seem to be the spot we were looking for. It just proves that over time one can become more desensitized to exposure. In our case it only took 24 hours. 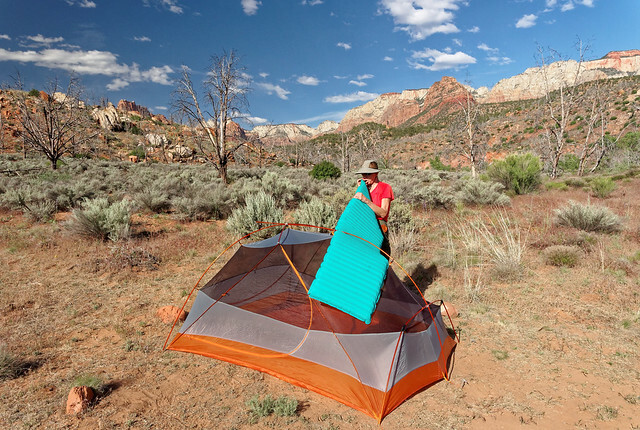 We camped that night at Palisades Creek. We had read that there would be a Lunar Eclipse late that night but neither of us was inclined to stay up very late. However given we both get up during the night to pee we thought we’d both have opportunities to see it and we did. It was an eerie sight. … to the luxurious sandy river bottom. After hiking 3 miles we took a break at Tanner Beach and happily made use of some of shade. We both commonly wear wet bandanas around our necks to help survive the heat however a wet bandana feels good no matter where you put it (in case you are wondering about the splint on my wrist - I had broken my wrist the previous summer (long story) and had complicated surgery to repair it in the fall. Although it had healed well I was still protective of it and decided to wear a splint while backpacking in Grand Canyon just in case I slipped on the all too common loose rock). 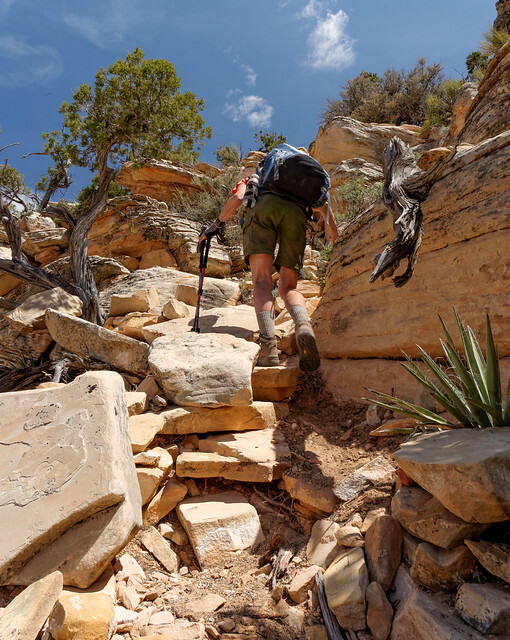 Compared to the Beamer Trail the Escalante is wonderfully open. 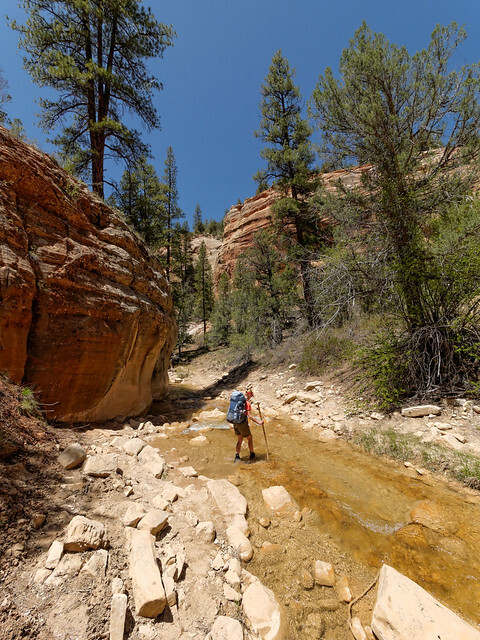 The Escalante Route is 12 miles from Tanner Beach to Red Canyon but one’s daily mileage is dictated by where there is access to water. Because of that, this day was a short one traveling only another 3 miles to our camp at Cardenas Creek. 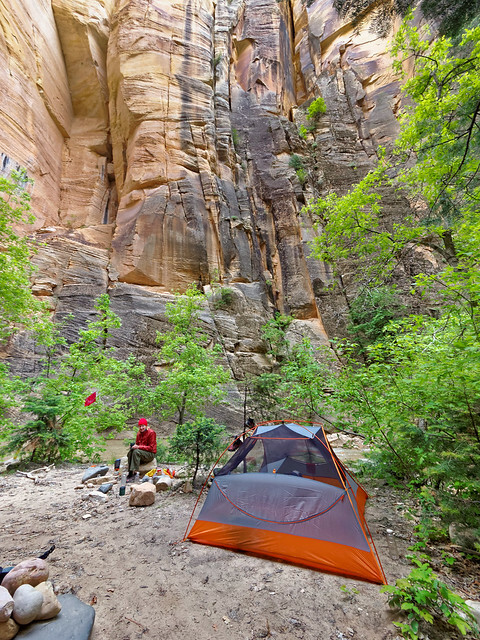 It of course is always an option to carry extra water and dry camp anywhere but it is our inclination to avoid that. Since we are retired we have an advantage over those who have more limited time in which to do such trips. … and soaking our pale feet in the oh so chilly water. 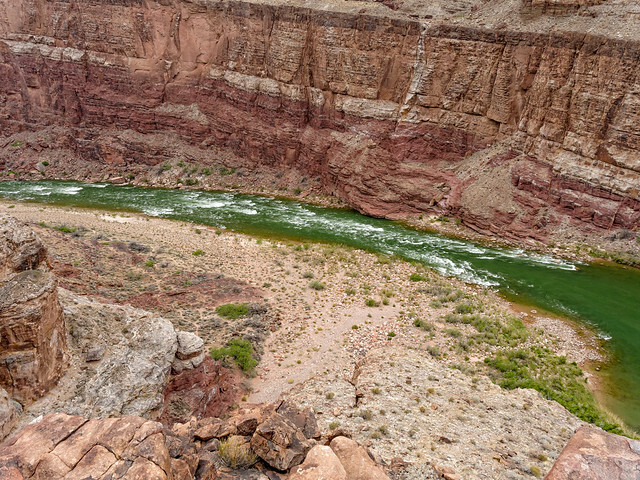 The Colorado River is frequently a muddy red but every time we have done a backpack trip where we had to get our drinking water from the river it has been clear and green, a lovely contrast to the surrounding area. 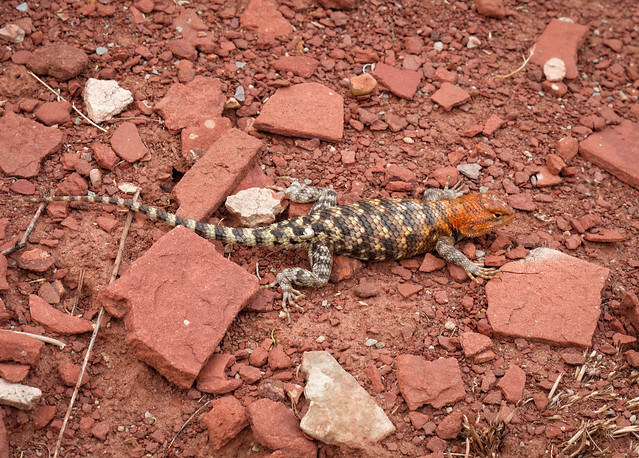 … but this is only the second snake I have ever seen in the canyon. 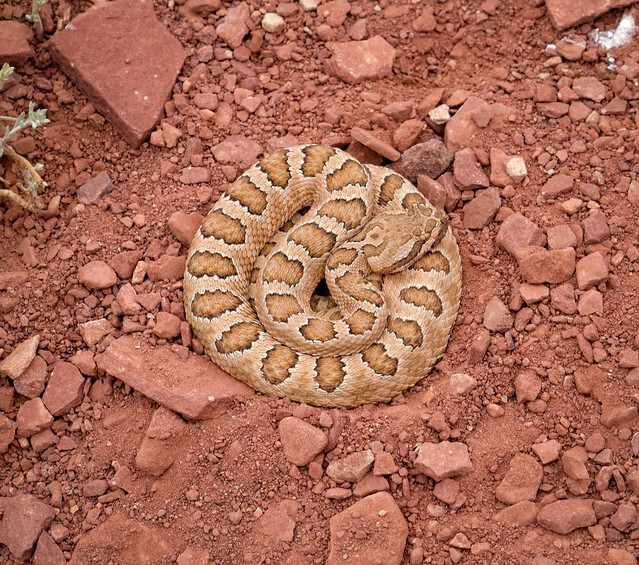 It was neatly coiled in the middle of the trail. As I always watch my footing carefully I saw it well before getting dangerously close. I gave it a wide berth and then waited a distance away for John to catch up (he had stopped to take photographs). John has a trail runner’s “second sense” of trails and does not need to watch his footing as carefully so I knew he could easily miss seeing the snake. As he got closer I called to warn him. He looked around for it but I could tell he didn’t see it and was dismayed as he kept walking. I yelled “Stop! Don’t move until you see it!” He finally located it; he had been looking off to the side of the trail instead of directly in front of him. He of course spent time photographing it and as he had a tripod along he was able to maintain a safe distance and still get his camera reasonably close. 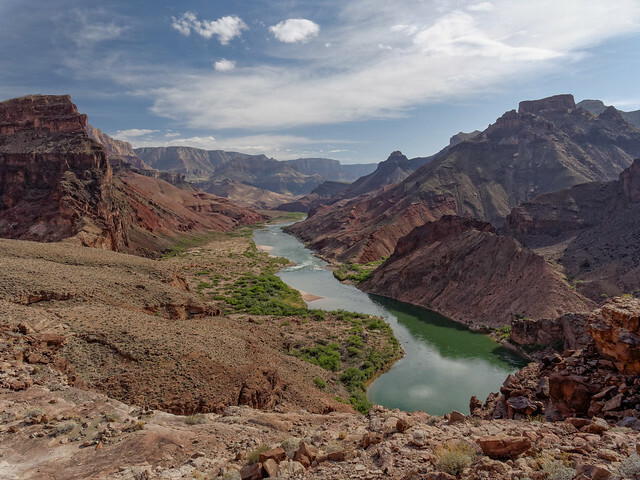 We continued on and reached the edge of Seventy-Five Mile Canyon. We could look down to its "mouth" and where we would end up for the day. 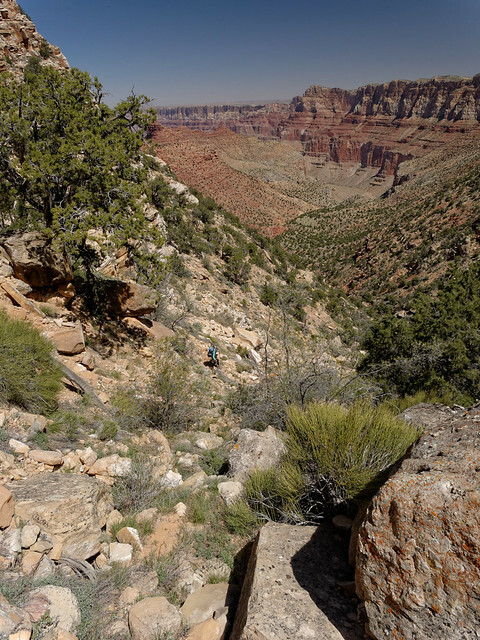 But first we needed to hike toward the beginning of the canyon in order to find the way down into it (I am barely visible on the canyon edge to the left in the photo below). 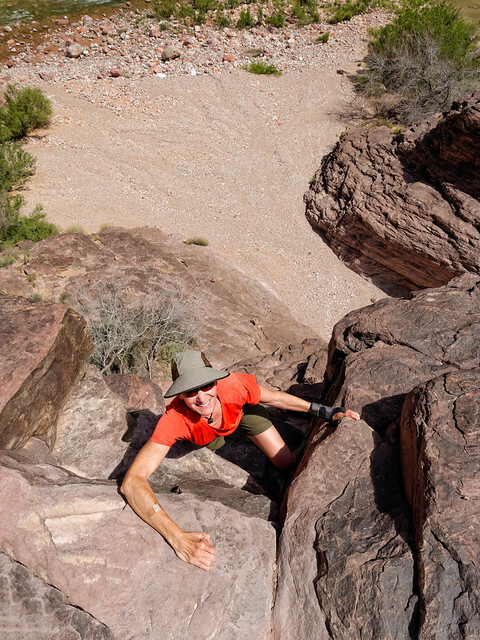 The route is quite steep in places but the rock is “grippy” and not difficult. There are a few “pour overs” along the way and some are more fun than others to negotiate. We eventually reached the bottom of the canyon and it was easy going. The shade and cooler temperatures were much appreciated. We had gone 7 miles for the day and set up our camp near the river. 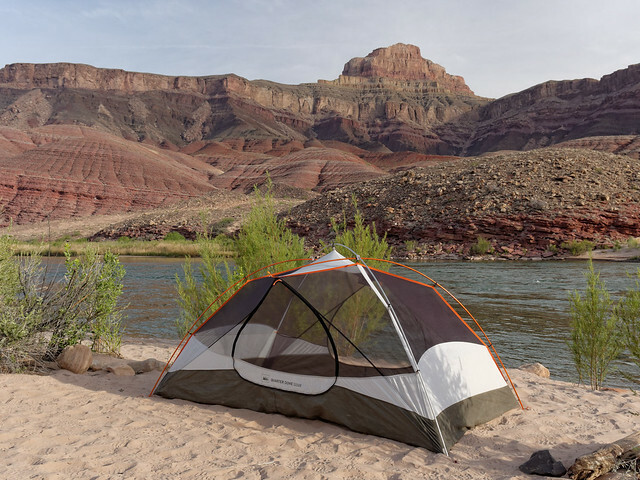 We had checked the extended forecast prior to starting this trip and it seemed okay so we had made the decision to leave our tent fly at home. However, we began to question that decision when we noticed the grey clouds moving in. Not long after we had gone to sleep it started to drizzle and the raindrops on our faces woke us up so we moved camp. 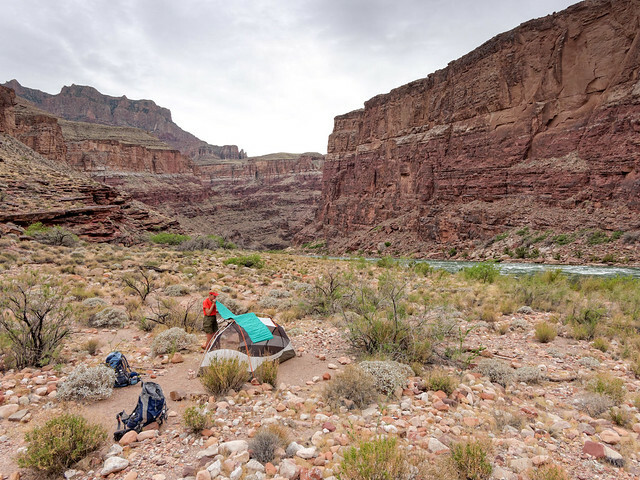 It turned out to be less disruptive than I would have thought as John had scouted out the area and had found a site upstream under a ledge that would accommodate our tent. I don’t think it ever actually rained very hard but we both slept much better knowing we’d stay dry. The next morning we continued on downriver. Looking ahead it was hard to figure out where our route was. We knew we would drop down to the larger beach at Papago (visible in the photograph below) and then climb over the outcrop in order to reach the small beach further downriver. I have read that some backpackers avoid that portion of the route entirely by waiting for a boat and hitching a ride. 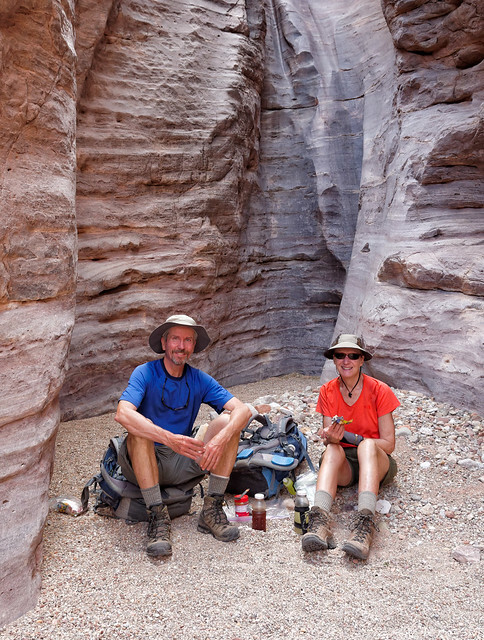 ... we decided to take a break in the shade of the shallow slot canyon. We then made our way up the infamous ledges which are about 35 feet high. As I had done this before I knew it looks worse than it actually is. 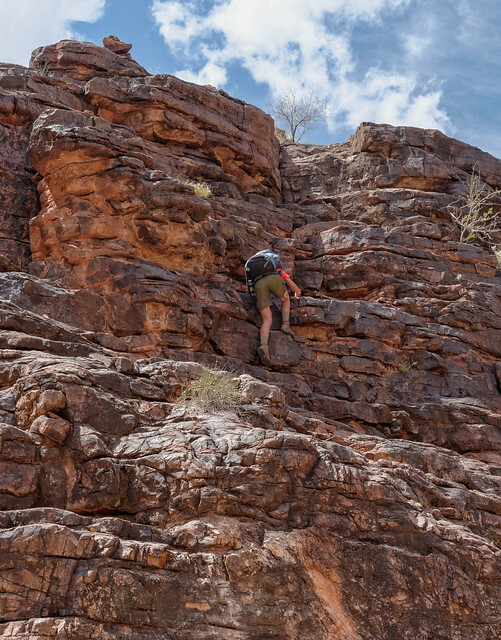 There are secure hand and footholds and well spaced “resting spots” so the climb up is not fatiguing. Some backpackers do this trip in the opposite direction but personally I would much rather go up this feature than down it. The first time we did this John wore his pack all the way up and I boosted my pack up to him. This time he boosted his own pack up before climbing up the last bit. I carried my pack most of the way up but boosted it up to him for the last bit. 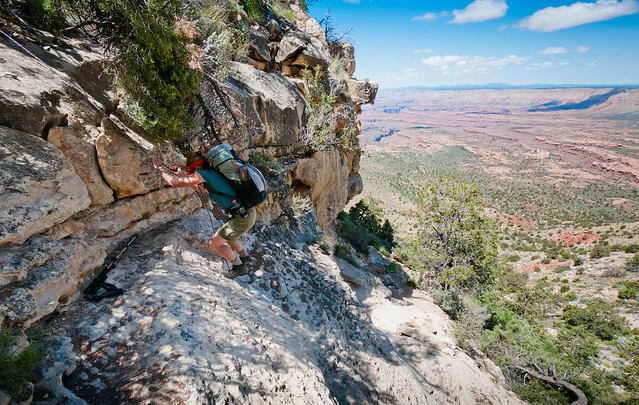 I've read it is recommended that solo backpackers carry some rope or webbing for raising (or lowering) their pack. From the top of the outcrop we could look down at the river and see our route well below. We could also see the aptly named Red Canyon down stream and where we would leave the river to head up the New Hance Trail. 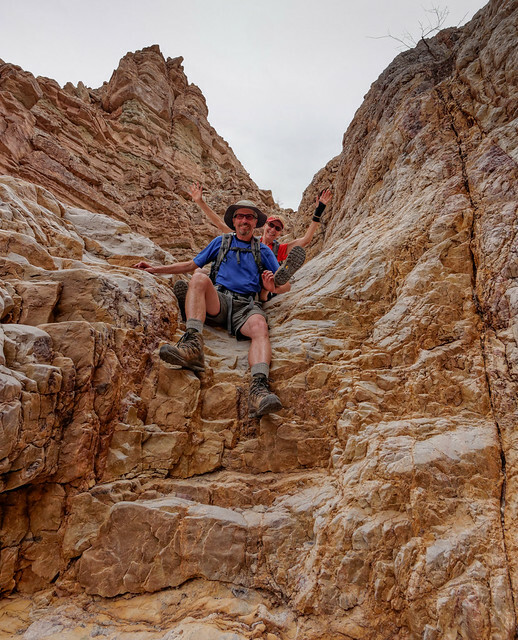 But getting to the top of the outcrop is only part of the fun. The route descends back to the river through an equally infamous rock slide area. The steep gully is filled with rock ranging in size from small loose gravel to large boulders. John went first and I always waited until he was no longer directly below me before moving. It was far too easy to dislodge rocks. After the loose rock nearer the top it was almost a relief to get to the slightly more stable boulders. We were careful and got down it without a problem and continued down the river. 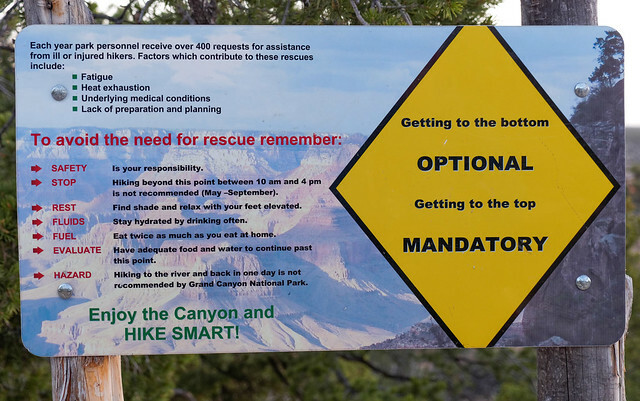 Once we got to Red Canyon we knew we had two options. 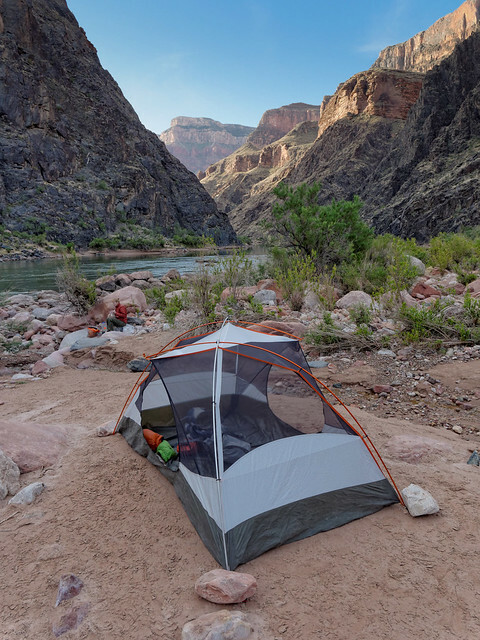 We could camp next to the river and have unlimited water or head partway up the New Hance Trail and dry camp. It threatened to drizzle and we found some protection from trees near the river so we seriously considered camping there. That is until a large group arrived and proceeded to settle in. It is not that we are antisocial but a large group occupies more than its fair share of “psychic space” in the backcountry. They became quite raucous as they each took their turn jumping into the frigid river. Therefore after cooking and eating our supper we decided to continue on. The New Hance Trail is only 6.5 miles so it didn’t matter how far we got. It continued to drizzle a bit and we kept an eye out for a ledge large enough to set up our tent under. 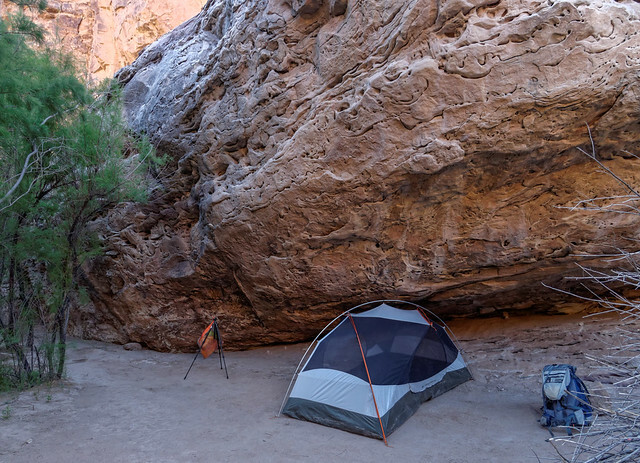 I know that a number of canyon backpackers don’t carry a tent and could make use of smaller, lower ledges but I just sleep better in a tent knowing we won’t be visited by rodents, reptiles or insects. I was getting a little uneasy but then we found a great established site under a substantial rock. Again I don’t believe it ever rained in earnest but it was nice to sleep without worry and be guaranteed that all of our gear would remain bone dry. Fortunately the weather became dry enough for John to go out that evening and take photos. It ends up there was a water source a short ways up the canyon, a spring as well as some potholes. The large group got an early start and passed our camp as we enjoyed our customary leisurely morning. However we easily caught up to them after they stopped at the spring for water and a food break. We had carried enough water up from the river so we were able to motor past them. Again let me say we are not antisocial. We love stopping and talking to one or two individuals. But there is something about large groups that annoys us. 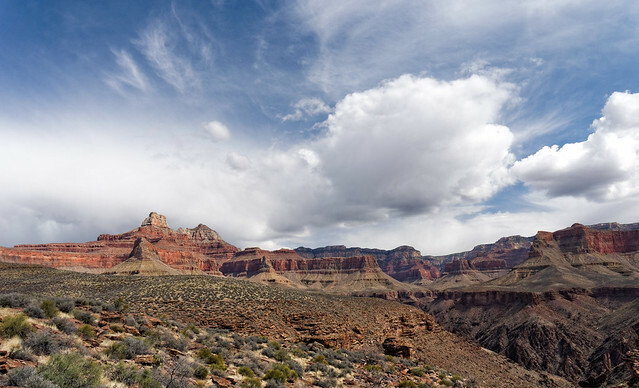 I think it is how people in groups have a tendency to talk louder and voices carry too well in parts of the canyon. We could hear them in the distance and felt a bit like we were being chased. But it didn’t last too long. Groups by their nature move more slowly and we out distanced them easily enough to regain our sense of solitude. 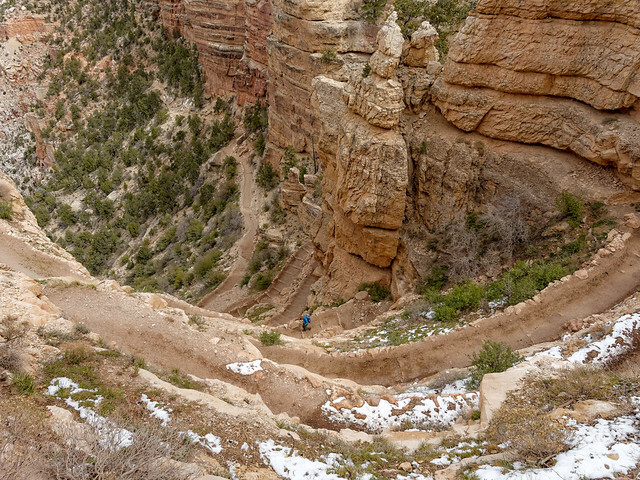 The New Hance Trail has a reputation for being difficult and is said that it may be the most difficult established trail on the South Rim of the Grand Canyon. 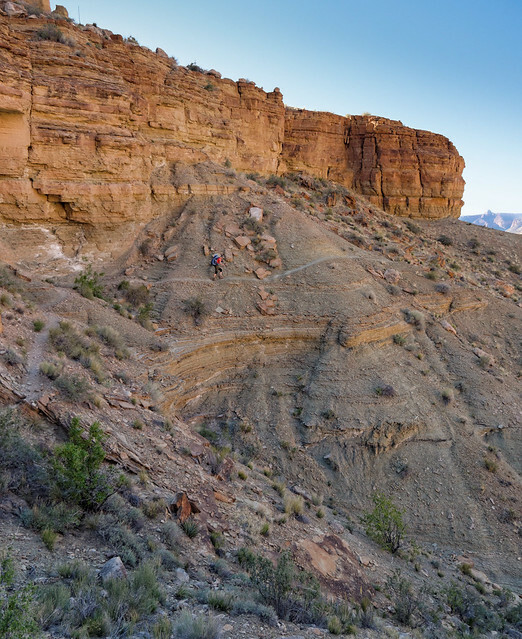 It has its moments but so does every other trail out of the canyon beyond the “Corridor Trails”. And just like every other trail in the park it is satisfying to look back and see how far you have come. All of our photos from this backpack trip are on Flickr. 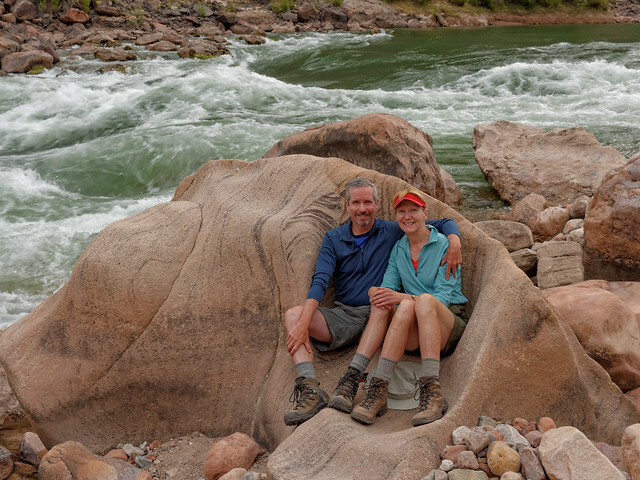 Our next trip was going to be a short and relatively familiar one; only 3 days/2 nights and we would be camping both nights in places we had camped the previous year; Hermit Rapids the first night and Boucher Rapids the second. Logistics were simple because we would be starting and ending at Hermits Rest and could park our car there. 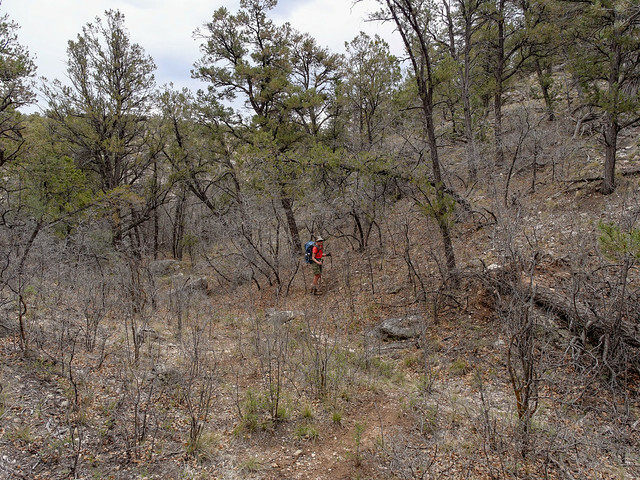 We first headed down the Hermit Trail for 9.3 miles to junction with the Tonto West Trail. I’ve seen a spot on the map of this trail labeled “Windy Point” and I think I know why. 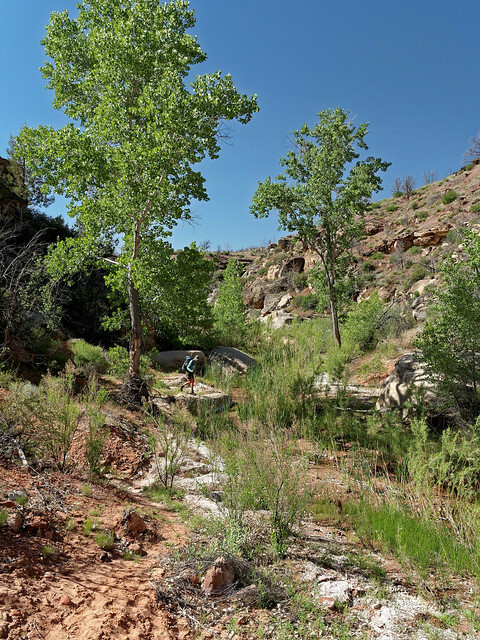 We were on the Tonto for less than a mile before we encountered a short side trail that drops into Hermit Canyon thus avoiding going all the way to Hermit Camp. It only saves 0.4 miles but it is more pleasant than having to go through the very civilized Hermit Camp higher up in the canyon. Something that surprised us the first time we hiked on this trail down toward the river were the unusual crystals that have formed in portions of the narrow canyon. The crystals are surprising delicate. 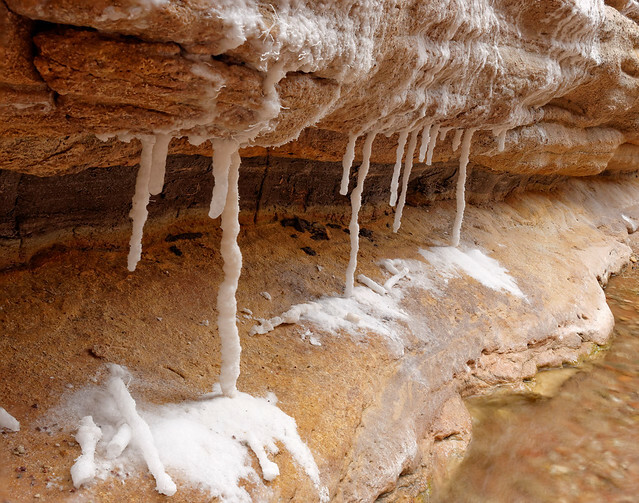 If one is patient enough then tiny drops of water can be seen forming on the ends of the tiny stalactites. 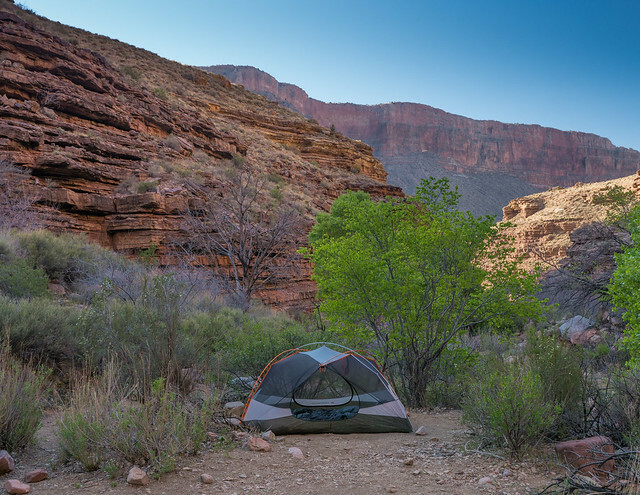 There are several established campsites near the creek close to the river. We have stayed in the largest in the past but it was occupied this time. I looked upstream but didn’t really find anything. 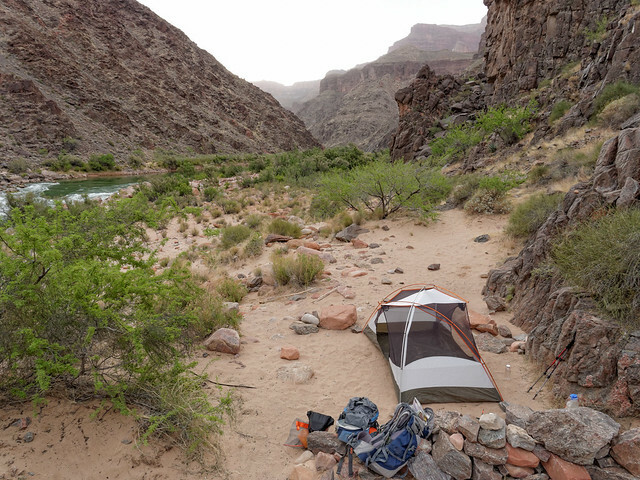 I then headed downstream and found a better, more private site adjacent to the canyon wall. It was a bit windy which must be a common occurrence as a previous occupant had built a rock wall to serve as a wind break. Surprisingly other than the one couple I had seen there didn’t seem to be anyone else camped near Hermit Rapids. Apparently most people stay at Hermit Camp and dayhike to the rapids. I’ve heard some say that by the time they got as far as Hermit Camp they were too tired to continue down to the river. 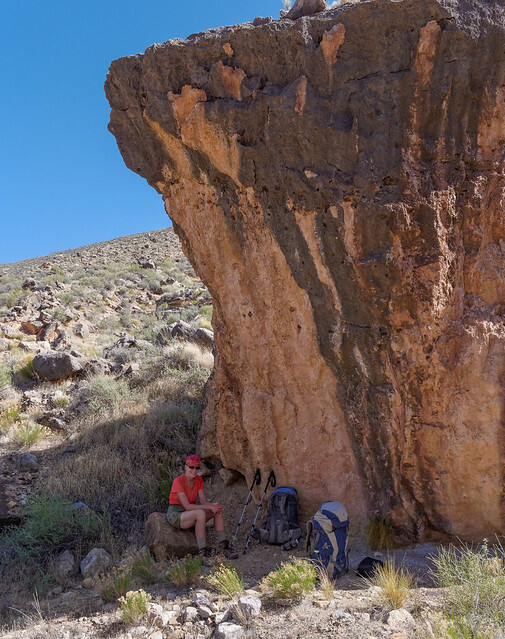 But for us it is well worth the additional effort to walk a little further for a more scenic site and some solitude (not to mention a very comfortable carved rock that fit our butts perfectly). 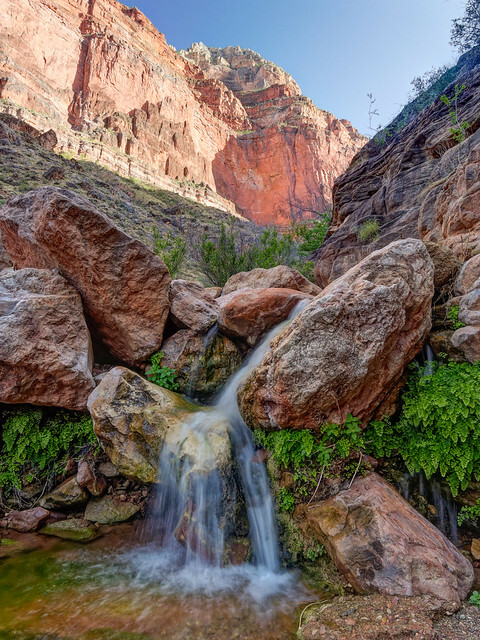 … remembering to enjoy the sight of flowing water, something that can be in short supply in Grand Canyon. 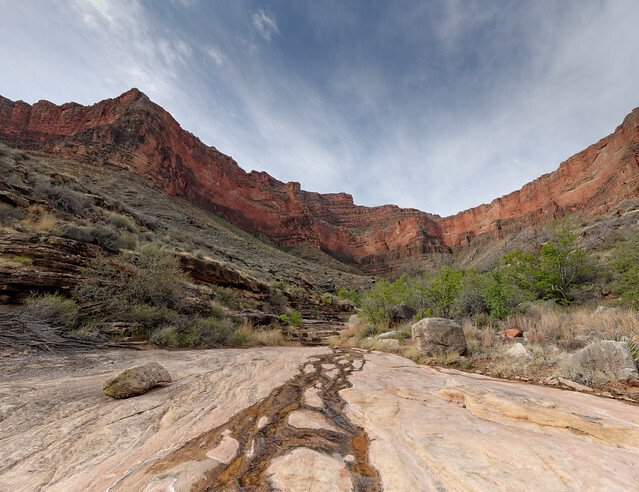 From the river it is 1.5 miles to the Tonto Trail which we would take toward Boucher Creek. From the Tonto we could actually see our destination for the day, the beach near the center of the photo below. It is 6.3 miles on the Tonto to Boucher Creek. We had plenty of time and I took a lengthy break at the creek while John explored upstream. 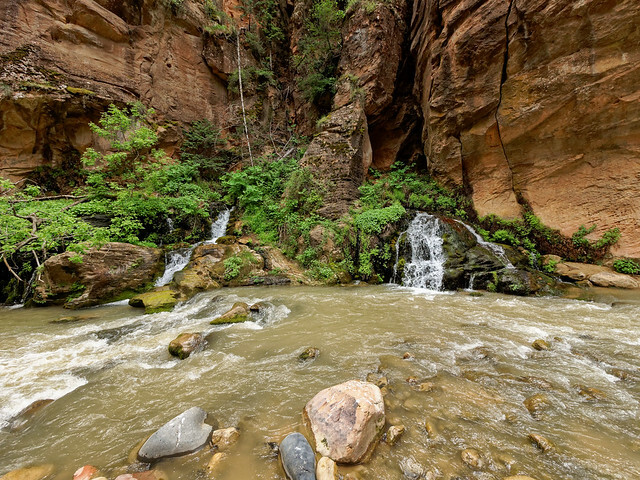 Like our experience in Cottonwood Creek it can be well worth it to explore off trail. We were surprised that there didn’t seem to be any other people camped in the area. 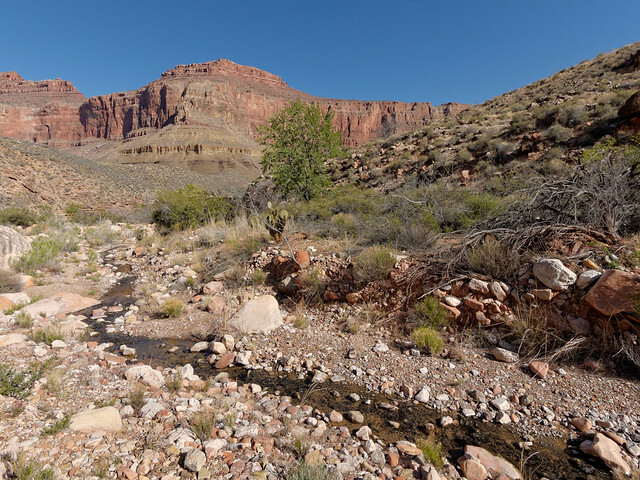 We had encountered a group (with one very talkative woman) at the creek and were relieved that they had planted themselves there rather than camp in more desirable sites (in our opinion) near the river. 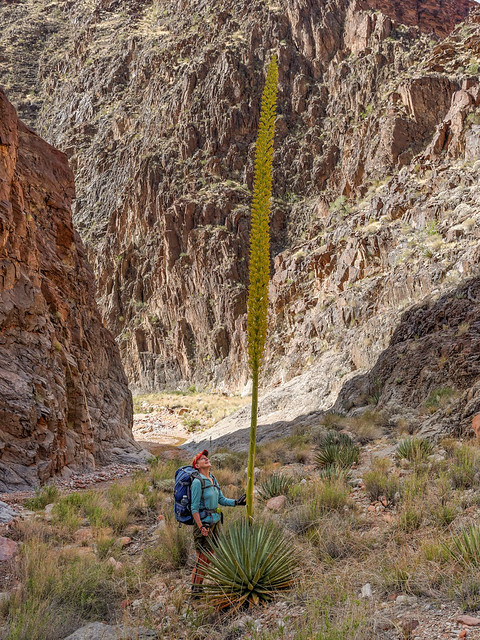 ... and along the way we encountered the tallest Century Plant we have ever seen. Once we left the creek we began the long climb up to the rim. 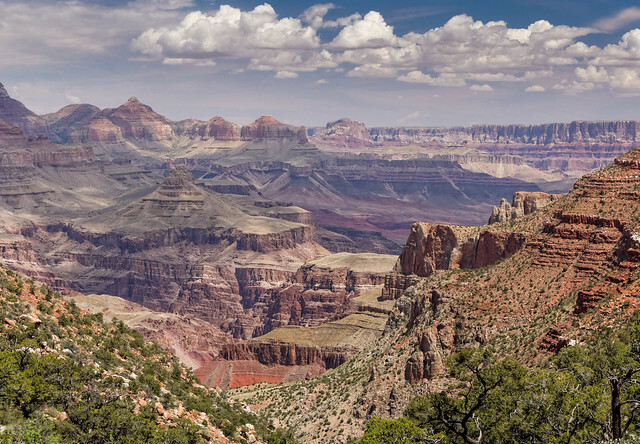 The most encouraging way to gauge one’s progress in the canyon is not to look up at the rim and how much more there is to do but to look back and see how far you have already come. The trail description states that the Boucher Trail is “arguably the most difficult and demanding of all of the south side trails". As we have already done every other south side trail we should be in a position to agree or disagree with that but I can’t do either. 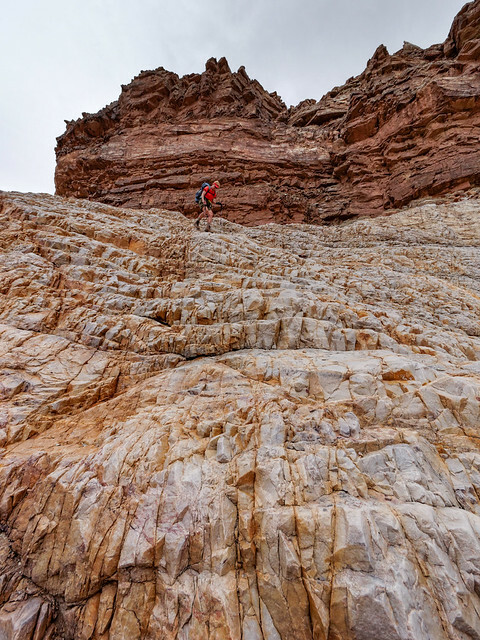 It doesn’t go all the way to the rim and while it does have sections I would much rather go up than down it also has long sections of easy traversing. The best I can say is it all depends; on your level of conditioning, your experience and especially your expectations and attitude. 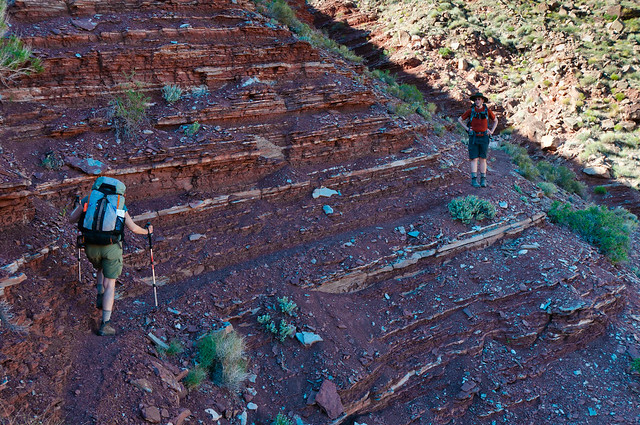 Backpacking in Grand Canyon is best approached with a “Zen like” attitude. There is no good or bad, easy or hard. It just “is”. The Boucher Trail is 7.8 miles but as I said it doesn’t go all the way up to the rim. 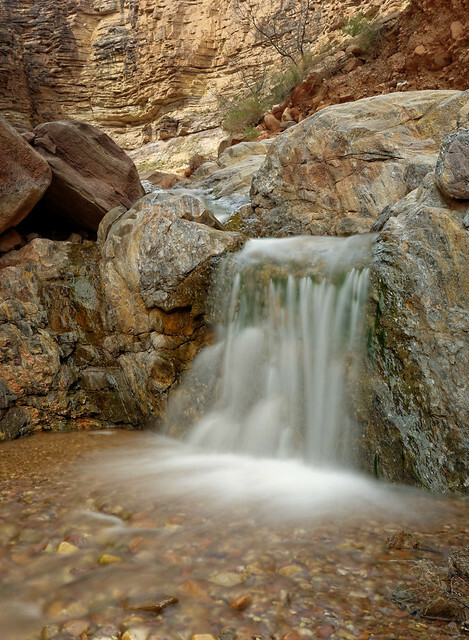 Its trailhead is at the Dripping Springs Trail which one takes for another 1.2 miles to the Hermit Trail. It is then an additional 1.6 miles steep miles to the Hermit Trailhead and where our car waited for us. Our hope was we would make it out before dark. It is not that we haven’t hiked by headlamp many times in the past but we were tired, hungry and getting chilly so we really didn’t want to take the time to dig out our headlamps. We just made it and gratefully sank into the soft car seats, cranked up the heater and drove to the nearest restaurant in the park. All of our photos from this backpack trip are on Flickr . In order to achieve our goal of hiking every trail south of the river we needed to do some dayhikes including doing the entire Dripping Springs Trail. 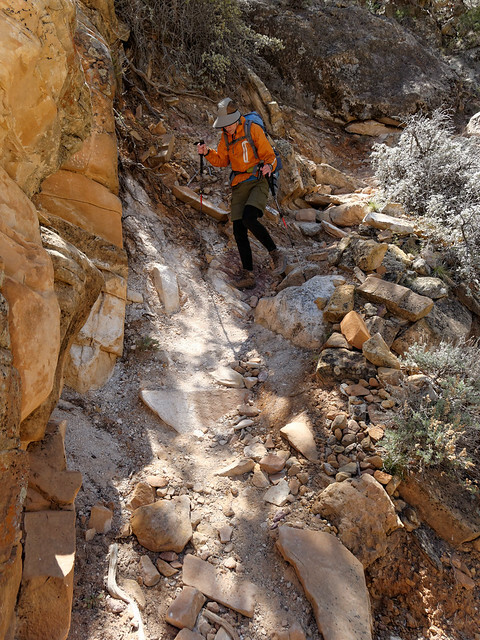 Typically hikers get to Dripping Springs via the Hermit Trail. I assume nearly all hikers turn around at that point however the trail does not actually stop there. It continues up to the rim. We did a loop on the Dripping Springs Trail from its other end to the Hermit and then to the Waldron Trail, another trail we had not hiked before. 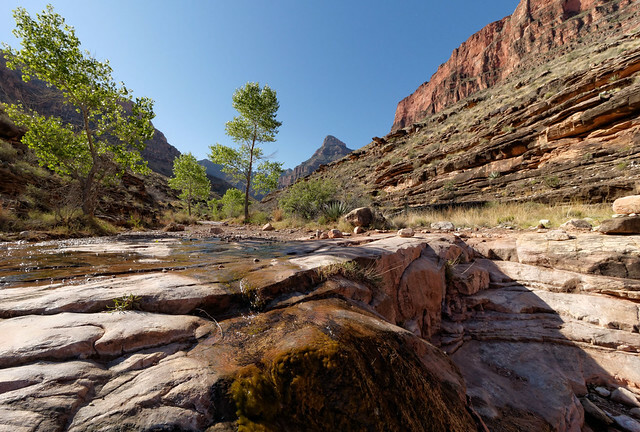 We first drove on the Horsethief Road to the Waldron Trailhead where we would to come out. We then walked on the road to Old Pasture Wash Road, continuing on it until we were finally on a trail. This portion of the Dripping Springs Trail is obviously not traveled much and is quite brushy. … to the actual spring. While I am glad to have done it as part of our overall goal it is not a hike I feel a need to repeat. We continued on toward the Hermit Trail and were on it for only 0.2 miles before arriving at the junction with the Waldron Trail. We have passed this junction several times on previous hikes and have been curious about it. It’s a scenic little trail and worth doing at least part way. It was 1.7 miles to the trailhead and another 1.1 miles back to where we were parked. For the sake of completeness I needed to walk the Rim Trail from the transfer station to Hermit's Rest. John has done this before but was willing to go with me. There are definitely some good views available from this easy trail. It is especially fun for us to look down and see so many places we have been. Photos from this dayhike (and others) are on Flickr. 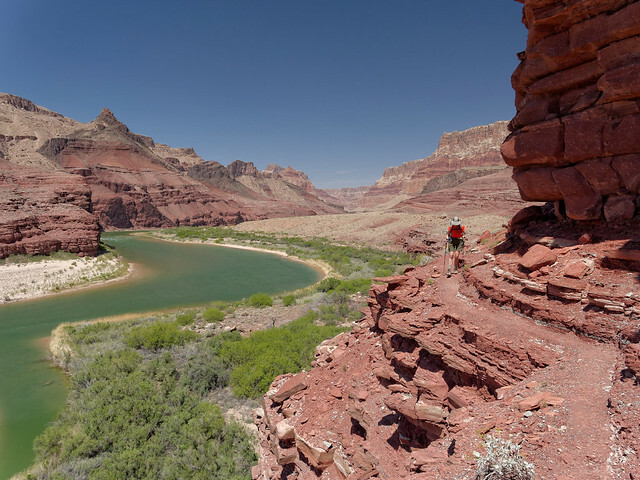 Once we completed the Boucher Trail we were supposed to have achieved our goal of hiking every trail south of the Colorado River. But not long before that we had discovered the map indicates there is a trail called the “Cape Solitude Doubletrack”. It’s a 23 mile out and back on an abandoned road that is flat and without a source of water. 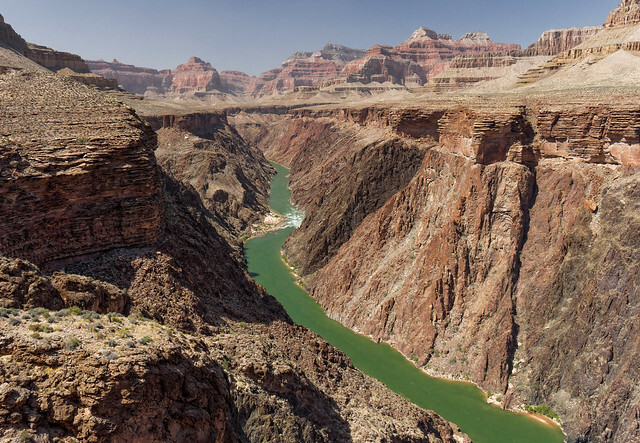 It provides a good view down to the confluence of the Colorado and the Little Colorado Rivers but we ran out of time so we will plan to do that one at a later date. … where we celebrated my 60th birthday. 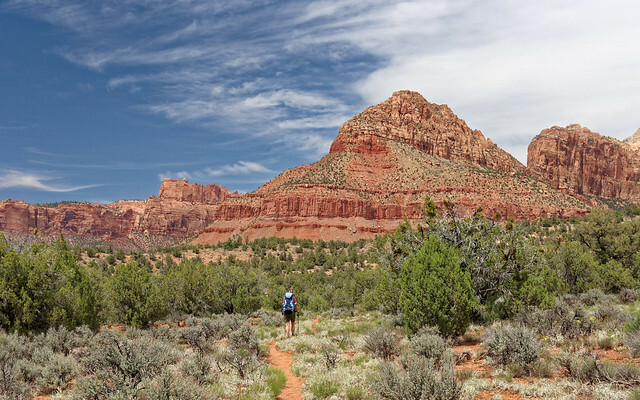 We then headed to Bryce Canyon National Park, Utah for a little dayhiking. All of our Bryce Canyon National Park photos are on Flickr. 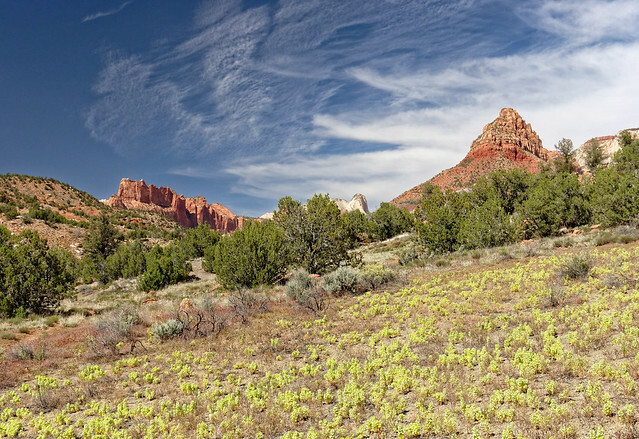 After that we spent several days in Escalante, Utah for its close proximity to Grand Staircase-Escalante National Monument. 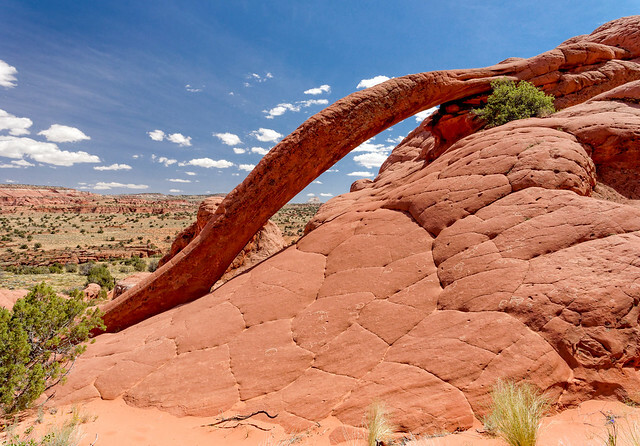 We first visited Devil's Garden and the unusual Metate Arch. All of our Devils Garden photos are on Flickr. 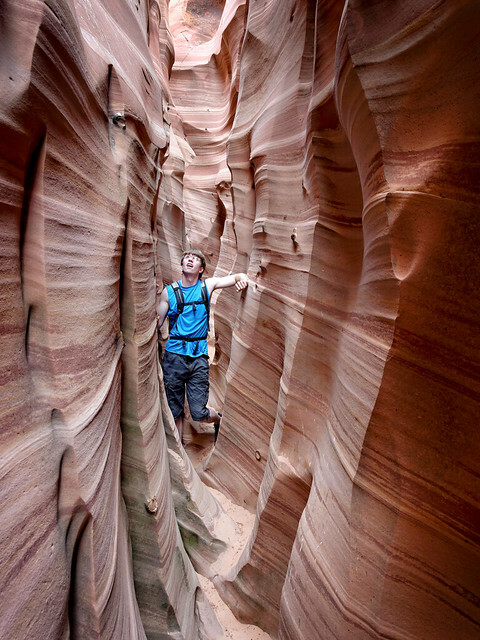 … and Spooky Canyon. 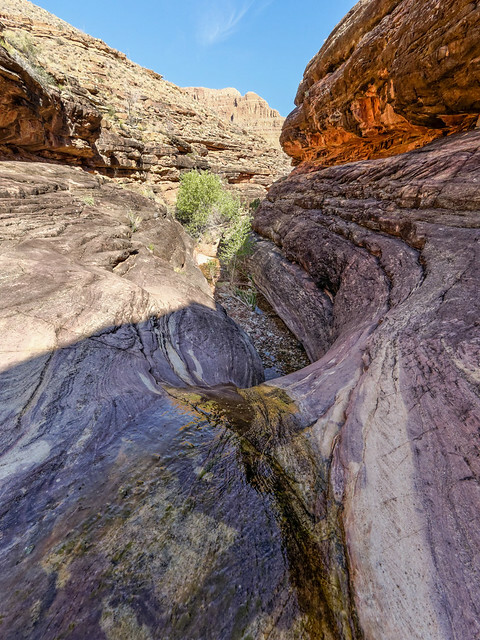 All of our slot canyon photos are on Flickr. In addition we hiked to the expansive Golden Dome (Dan is barely visible toward the lower right corner). While we were there we heard voices coming from above and watched as first a rope was dropped through the arch and then a young woman proceeded to lower herself to the water. All of our Golden Dome photos are on Flickr. At that point it was time for Tom to go home but Dan was able to spend a few more days with us. 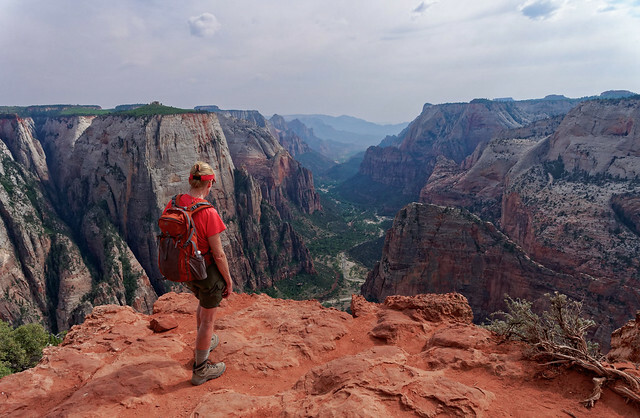 We spent a day in Zion National Park and he and John hiked to Observation Point while I took Tom to the airport. All of our Observation Point Photos are on Flickr. 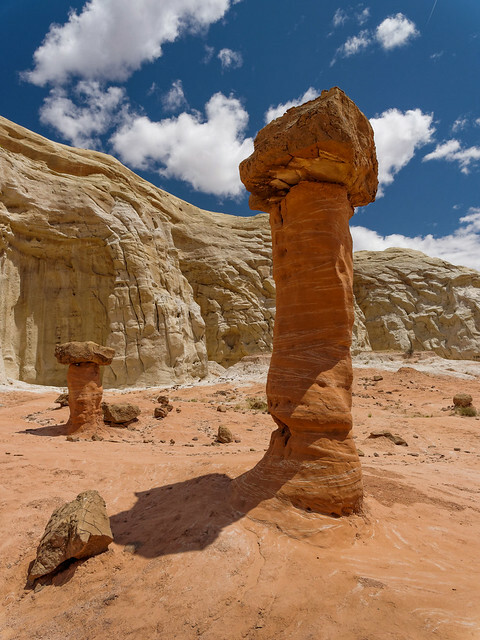 We then headed back to Grand Staircase-Escalante National Monument in order to visit the unusual “Toadstools”. All of our Toadstools photos are on Flickr. 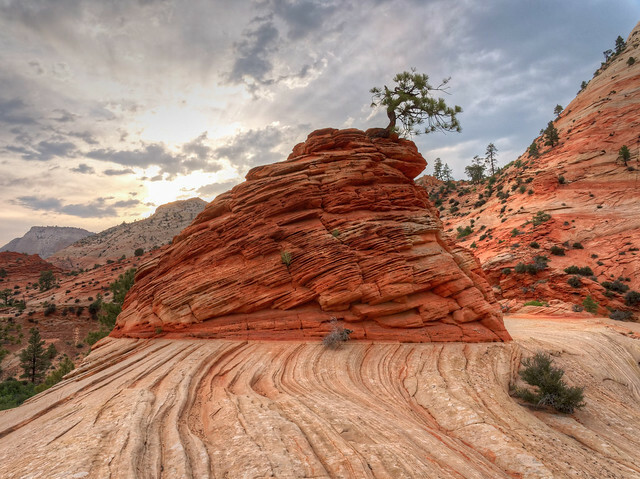 After that John and Dan spent many hours exploring and taking photographs in White Pocket within Paria Canyon - Vermillion Cliffs National Monument in Arizona. 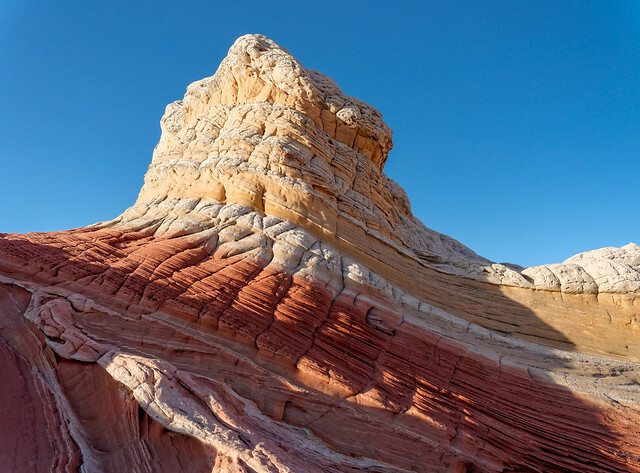 Although, given the variety of color there, I am perplexed as to how it can be named simply White Pocket. 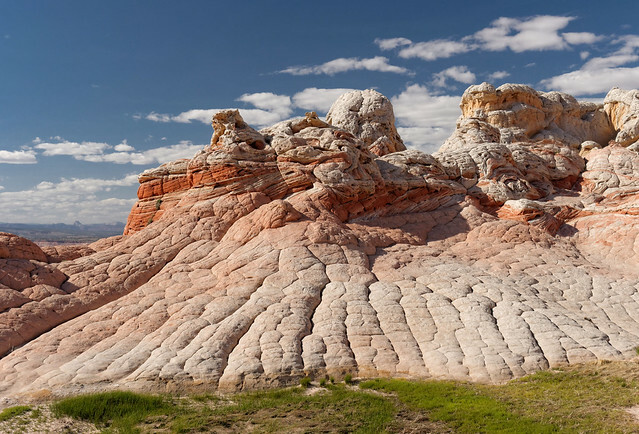 All of our White Pocket Photos are on Flickr. 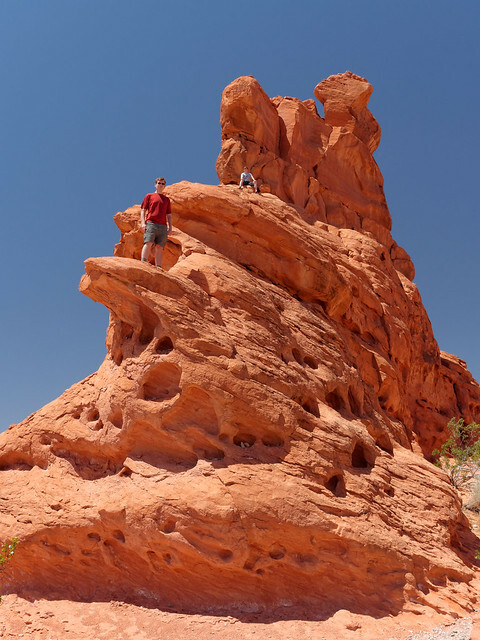 Our final hike with Dan was to the appropriately named Cobra Arch in Paria Canyon - Vermilion Cliffs Wilderness, Utah. All of our Cobra Arch photos are on Flickr. 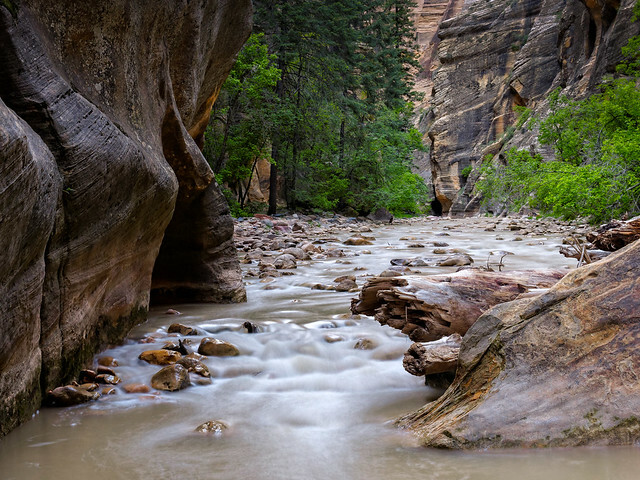 After Dan went home we headed back to Zion National Park. 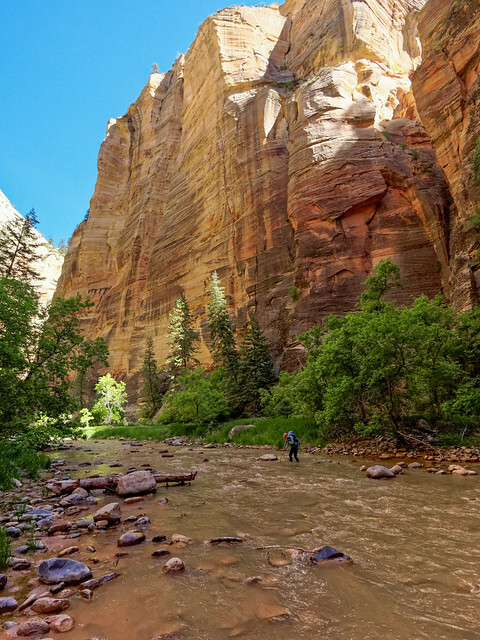 We have already done some backpacking and hiking in Zion and we realized that it was possible for us to hike every trail within this park. 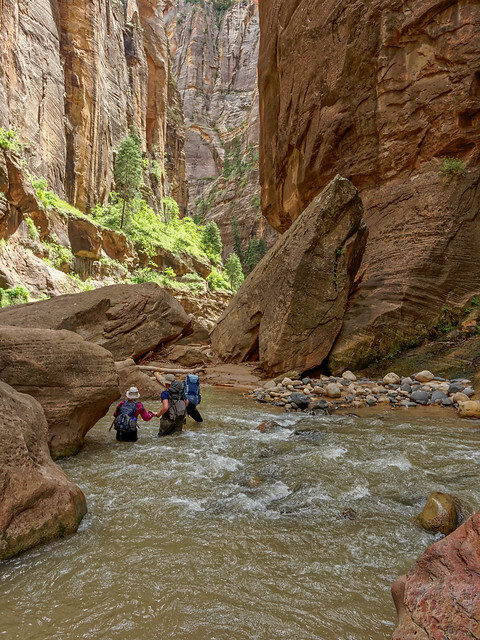 The first trip we did was a 2 day/1 night backpack trip through the iconic Zion Narrows. 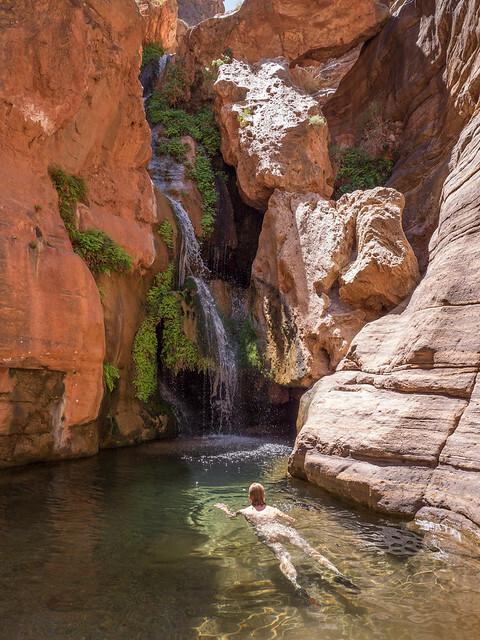 Most people dayhike in the Narrows from the bottom up (meaning they wade up the Virgin River). 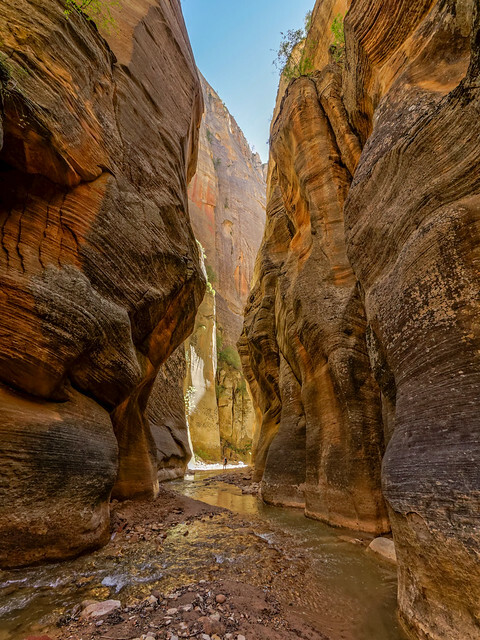 Hiking the entire Narrows from the beginning is done as a multi day trip or a long dayhike. Either way you’ll need transportation to the trail head. In addition, given the depth and cold temperature of the water, one may choose to rent either dry pants or a “farmer John” wetsuit. Also useful are neoprene booties and canyoneering boots. 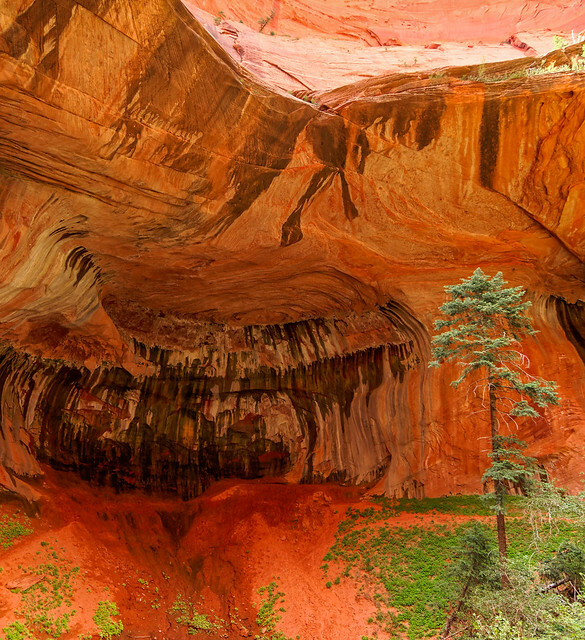 All can be obtained from Zion Adventures or Zion Rock and Mountain Guides, both are located in nearby Springdale. We heard that the water could be more than waist deep in places so we opted for the wetsuit. 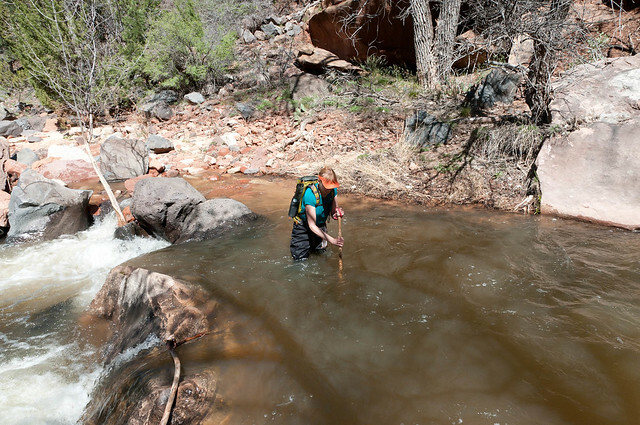 The first day did involve a lot of wading in the Virgin River but it was shallow so we kept the wetsuits in our packs. Which was great because neither of us relished the idea of putting on a cold damp suit in the chill of the dark canyon the following morning. The farther we went the higher the walls became and the more narrow the canyon. The way down the river is blocked at one point by a boulder/log jam which created a waterfall. Fortunately there is a narrow crack through the adjacent wall. I’m not sure how we would have safely gotten past it otherwise. 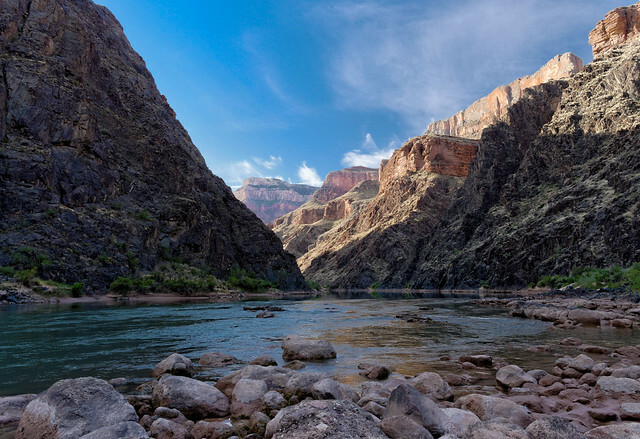 The dark canyon can feel oppressive but closer to midday when the sun is directly overhead one gets glimpses of welcome sunshine. Deep Creek joins the Virgin River not far above where we would camp. Whereas the river had been clear the creek was cloudy with fine silt. We rely on a SteriPen for our water treatment and weren’t sure how effective it would be in cloudy water therefore we used Iodine tablets. What we didn't know at the time is it can be used in water that is as cloudy as “weak lemonade”. One just needs to treat the water twice. I wish we had known that as unfortunately, Iodine is not effective against Cryptosporidium, a water borne protozoan, and we both apparently picked it up on this trip. The next morning we donned our thankfully dry wetsuits and headed down the river again. 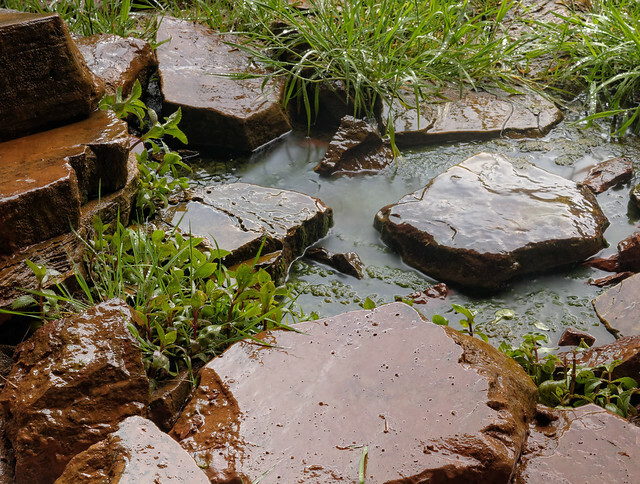 I discovered that not only did the silt make the water cloudy but it caused the rocks to be slippery. When we rented our gear we were also provided with a stout staff. 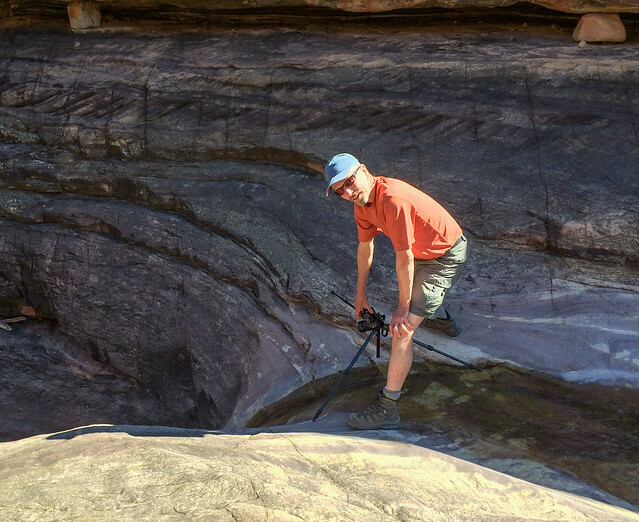 Some people use trekking poles but the staff was highly recommended. John has better balance than I do and is less paranoid about falling so he moved more quickly down the river. On the other hand I gingerly picked my way and relied heavily on my staff. Fortunately he stopped frequently to take photos so I didn’t fall behind. Along the way more springs flowed into the river increasing the volume. … but let go at some point and almost lost her (she is just visible to the far left). We could tell we were really getting close to the end when we encountered hordes of scantily dressed girls exclaiming about the cold water and gingerly picking their way. 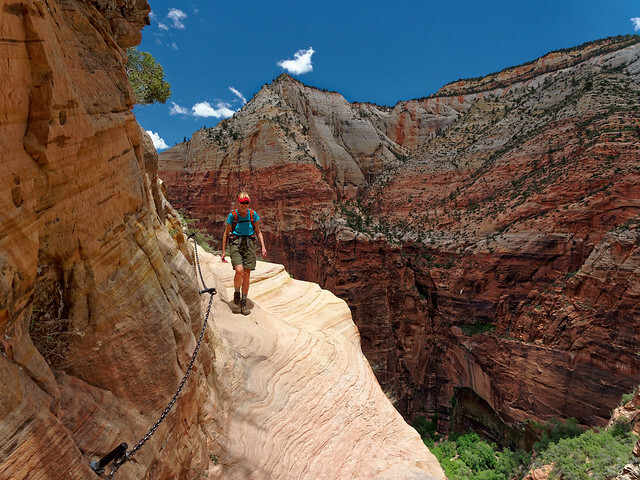 This is a very popular hike and sometimes makes lists of best hikes in the world. I don’t think we would go so far as to say that, after all we have been some amazing places. We prefer more solitude and are mountain people at heart who also have a great fondness for the desert. 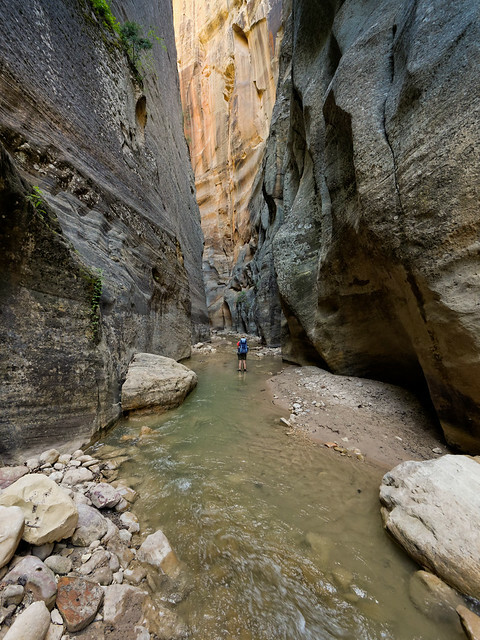 But the Narrows is certainly a unique hike and worth being on some sort of list. All of our photos from this backpack trip are on Flickr. 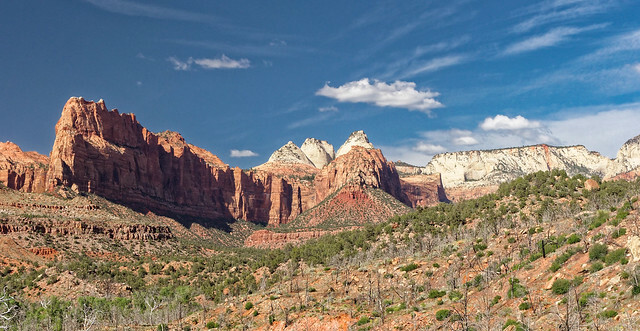 The next trip we did was in a part of Zion known as the Southwest Desert. 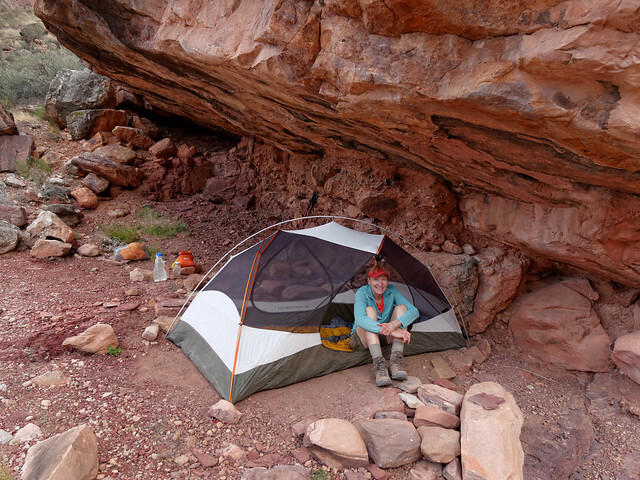 We did a 2 day/1 night backpack trip on the Chinle Trail. 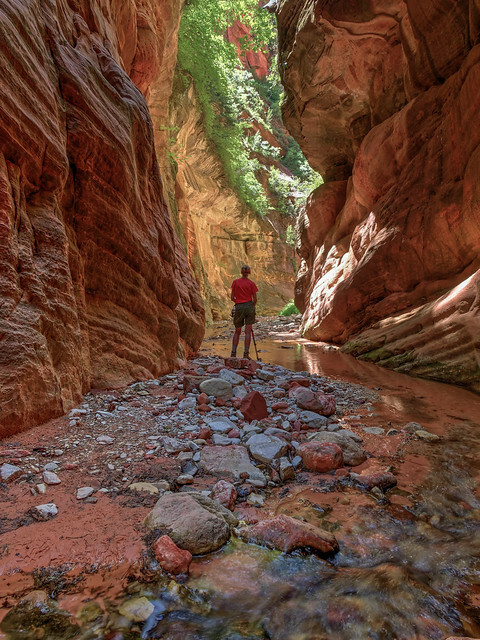 This trail was a dramatic change from the close confines and wet darkness of the Narrows. 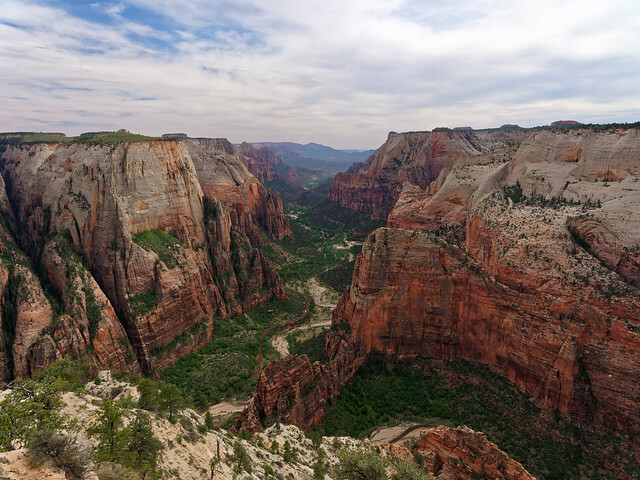 The views are quite expansive and a change of pace from the more commonly visited Zion valley. 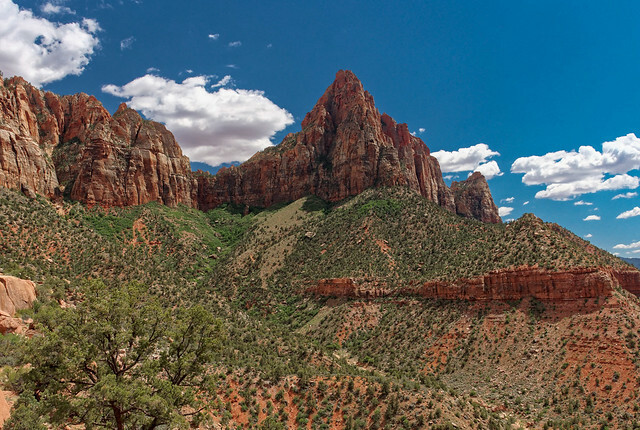 The views also include the backsides of prominent features seen from the valley such as the Court of the Patriarchs. ... and ate our supper enjoying the coolness around Coalpits Spring. 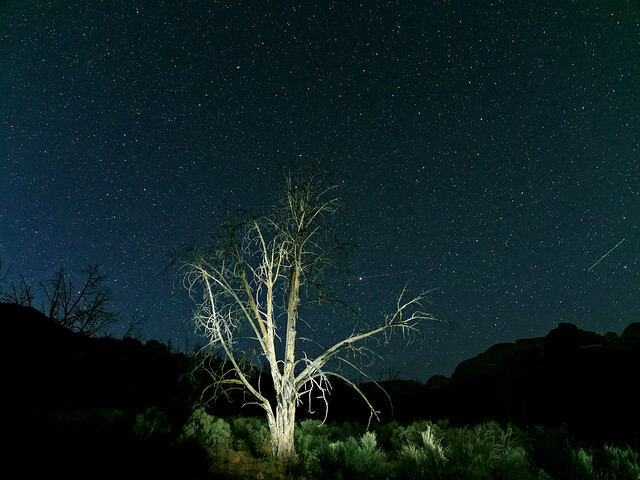 John took the opportunity to try his hand at night photography but readily admits he has a lot to learn (and is thinking of purchasing yet another camera, one better suited for the task). 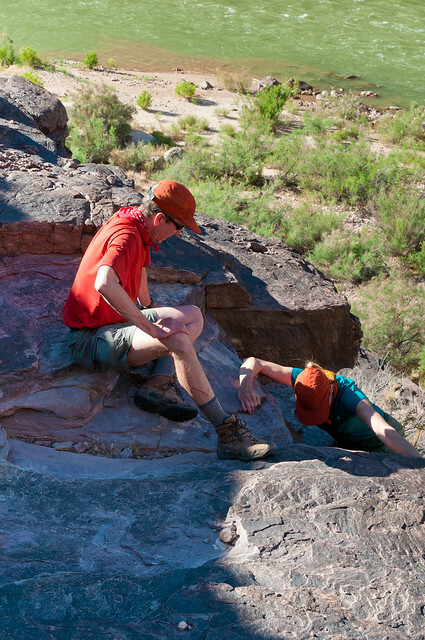 We hiked out the next morning down the Coalpits Wash. All of our photos from this backpack trip are on Flickr. 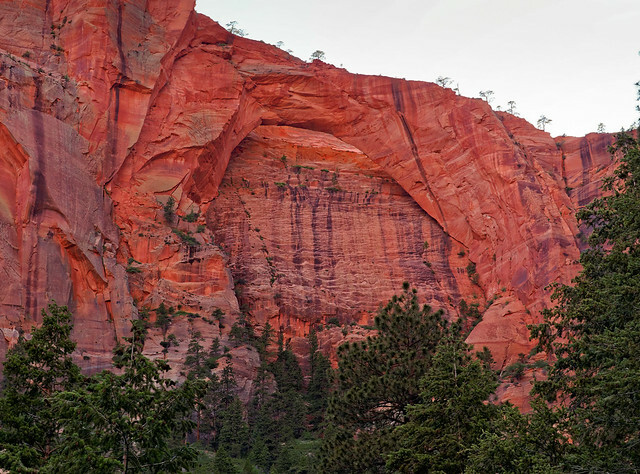 Our last backpack trip in Zion was a short 3 day/2 night trip on the LaVerkin Creek Trail in Kolob Canyon located within the lesser visited western portion of the park. 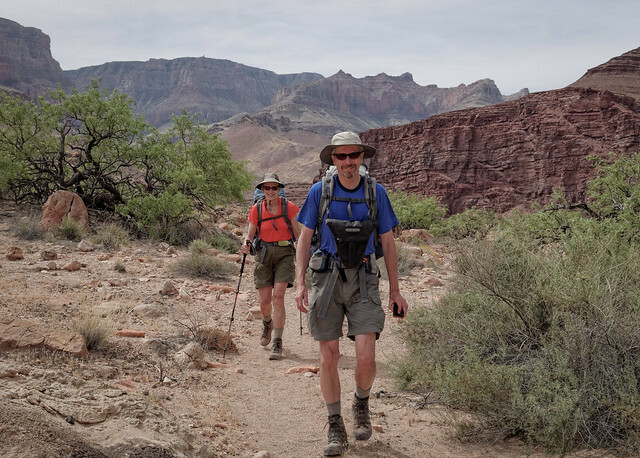 We have done the first part of this trail before but rather than turning off on the Hop Valley Trail toward the West Rim Trail we would be continuing up the creek. 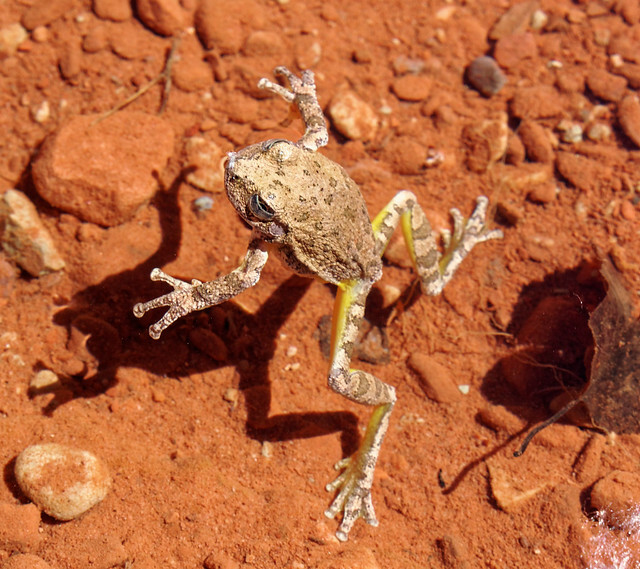 The creek was inhabited by numerous frogs, some in the process of mating and laying eggs and some still "looking for love". 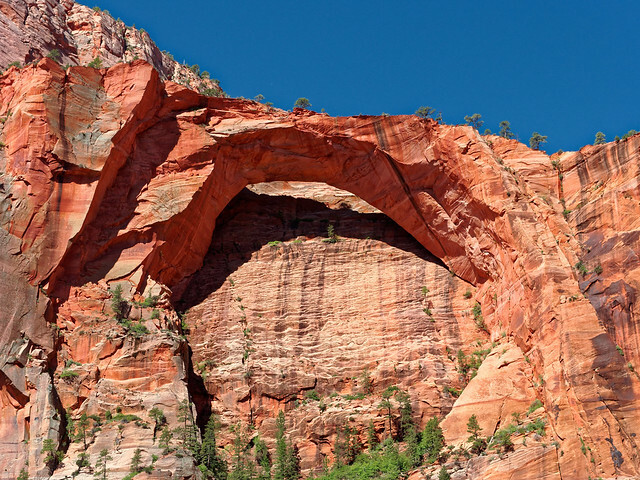 A worthy short side trip is to see Kolob Arch. 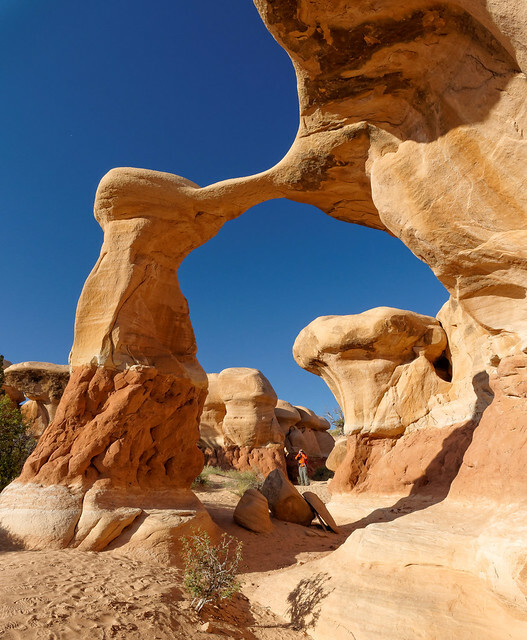 I have read that this arch is the second longest natural arch in the world after Landscape Arch in Arches National Park. 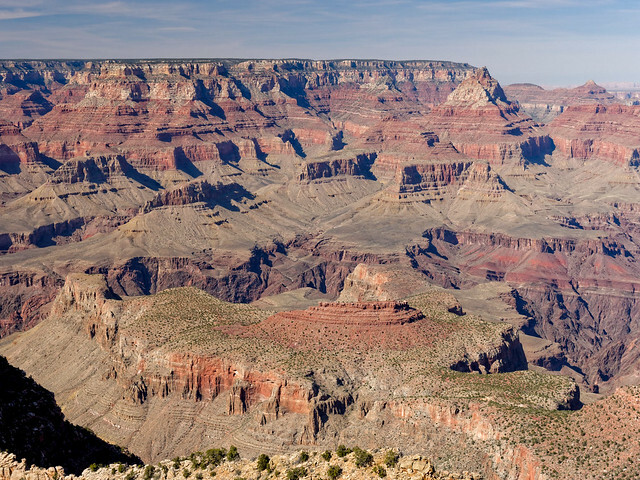 Unfortunately it is impossible to fully appreciate its true size as one is unable to get very close to it and there is a canyon wall directly behind it. Some choose to dayhike to this feature which is quite doable distance wise. 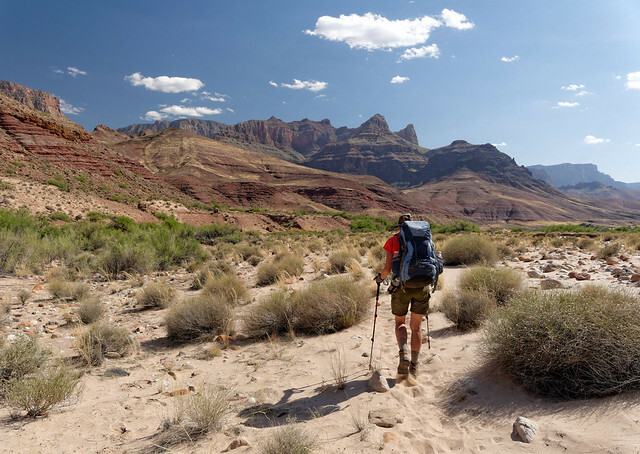 However, when dayhiking one is more limited to the lighting conditions which can be less than optimal depending on the orientation of the feature. For example the photo below was taken in the afternoon when dayhikers would commonly be there. This photo was taken the next morning when John did the short hike from our campsite. 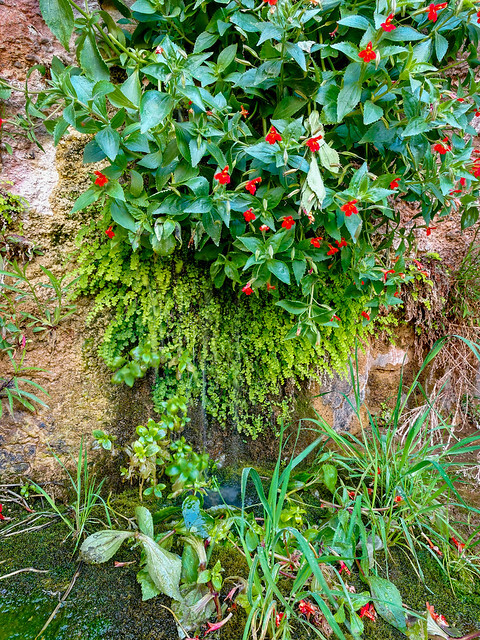 … to see Bear Trap Falls. While also decided to dayhike up Willis Creek. However, it eventually became quite brushy and as it was not very scenic we tired of the activity and went back to our camp. This was the last backpack trip we had planned for the spring but having done six in a two month period is not too shabby. All of our photos from this backpack trip are on Flickr. … and the Pa’rus Trail. 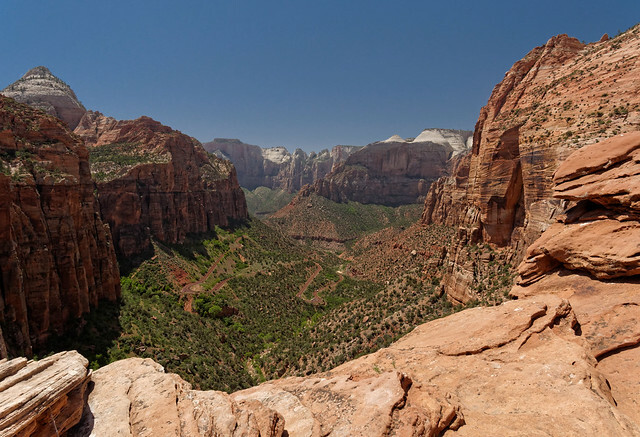 We are slightly compulsive and included the very short walkway to the Court of the Patriarchs overlook. 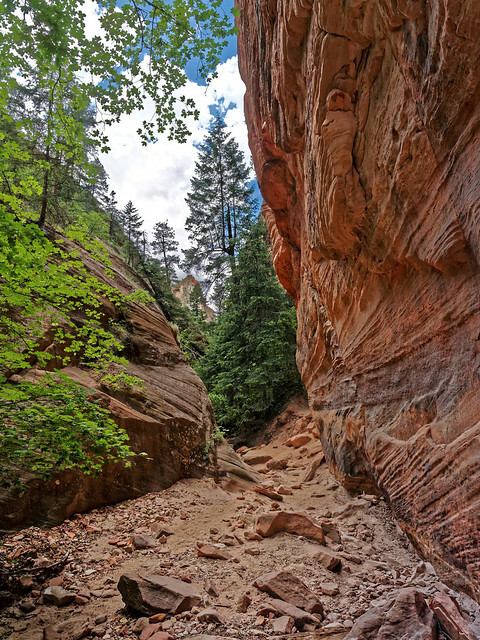 Another trail we had not done before was to Hidden Canyon. This proved to be a bit disappointing. I suppose my expectations were too high for a feature with such a mysterious sounding name. This is one of those cases where the trail is far more interesting than the destination. 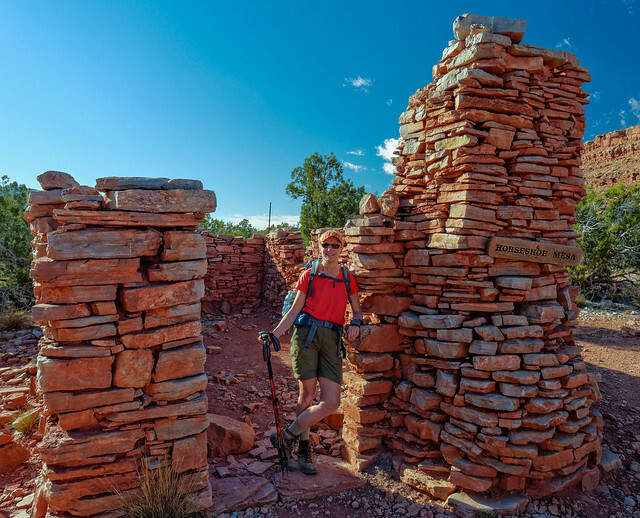 We did the nondescript Archeology Trail and the more scenic Watchman Trail. 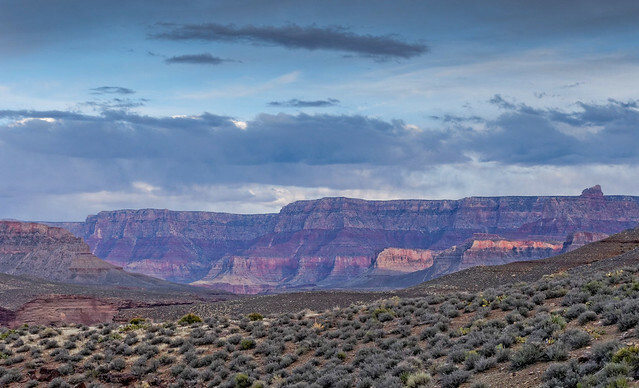 At one point we drove our motorhome to the Ponderosa Ranch located above the park beyond the east rim and hiked down a portion of the East Rim Trail we had not done on a previous trip. We also hiked to Observation Point from the Ponderosa Ranch. The destination is a worthy one but the trail from the valley is far more scenic. All of our photos of Observation Point are on Flickr. In addition John did some exploring in an area accessed from the road known as the “Checkerboard”. After all of the above backpack trips and dayhikes we had one last trail to do, the Taylor Creek Trail. 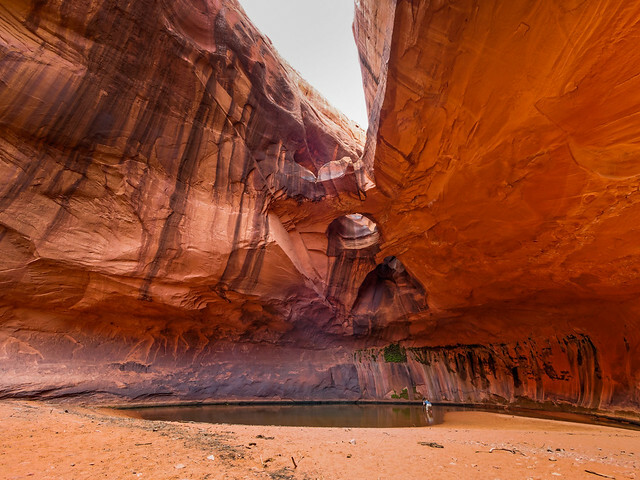 The notable feature on this hike is a large alcove at the end. 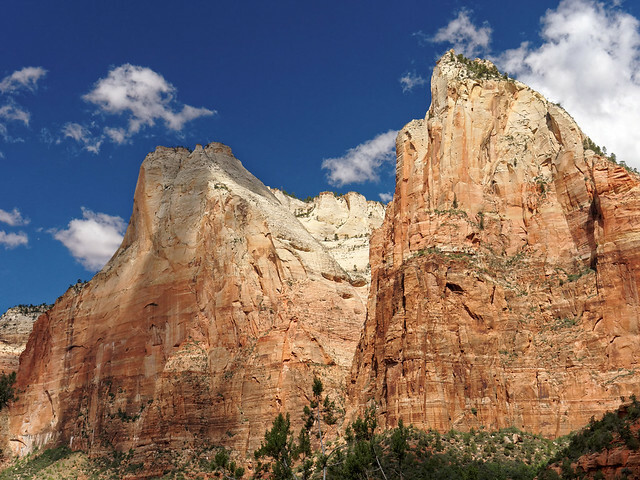 All of our Zion dayhikes photos are on Flickr (not including our photos taken from Angel's Landing on a previous visit). This was our last big view of Zion before leaving the park. Although we love this park I think it might be awhile before we return. 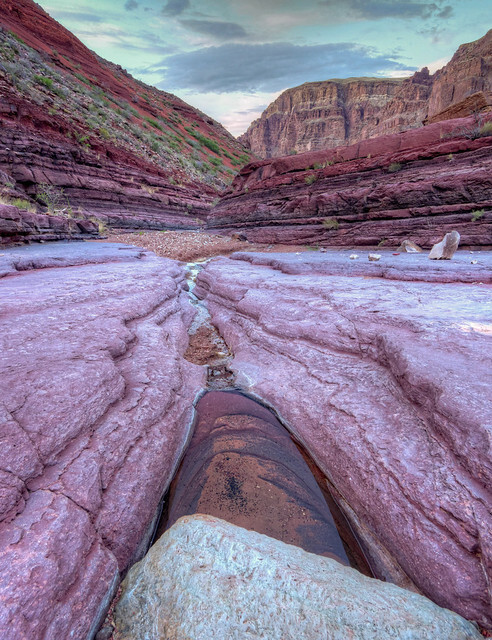 There is just so much we have not yet seen in the American southwest. 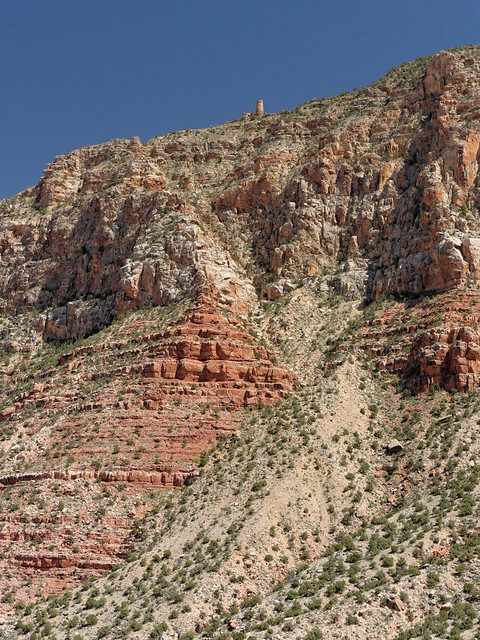 After leaving Zion it was time for us to head toward California where we planned to live at a higher altitude until it was time for us to head to Peru. It sounds odd but I’ve already written about that adventure. However, unlike most blogs this one is not strictly in chronological order. And it will only get worse. The next post will cover time we spent traveling in Oregon and California in the month before the trips described above as well as what we did in Washington State after we got back from Peru. But does it matter? I think not. 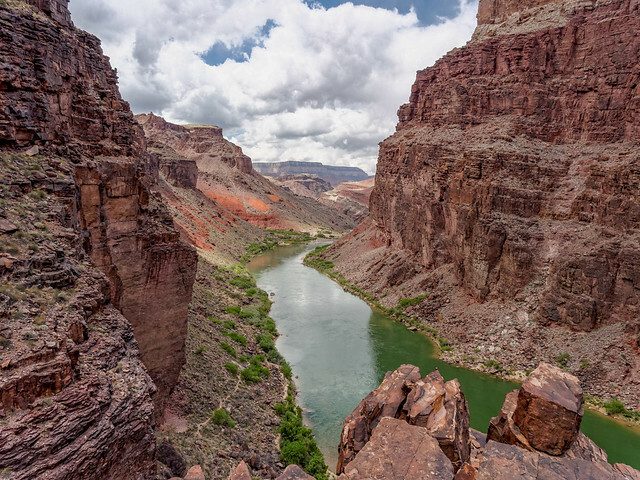 If you read the post above then you know we have now hiked every trail between the South Rim of the Grand Canyon and the Colorado River within Grand Canyon National Park. Intellectually I know I should be proud of our accomplishment but I have a bad habit of discounting my own achievements. The way I see it is if a woman in her late fifties with bad knees who is not all that fit can do it then how hard can it be? But John says what I lack in physical ability and youth I make up for with "grit". That got me thinking. What exactly is grit? The definition includes such words as strength of will, toughness, hardiness, determination, tenacity, perseverance, endurance and mental strength. It is hard for me to see myself in those words because I’ve always thought of myself as a “wuss”. I possess a vivid imagination and can always visualize the worst that can happen. In addition I have a mood instability that predisposes me to anxiety. However, the fact remains we have done something that required a pretty big effort and having some grit was an essential component. So presuming I now have it and I wasn’t born with it then where did I get it? It seems to me that in order to develop grit a person needs opportunities to be challenged in a way that stretches their comfort zone. They also need to take advantage of those opportunities by being willing to try something challenging. They have to be “game”. But looking back I can see that I simply didn't have any such opportunities while growing up. However, that began to change once I met John. Early in January 1977 while we did some winter camping in Red River Gorge in eastern Kentucky John decided we should get to the top of Chimney Top Rock. I had never done any rock climbing and it was cold and snowy but I surprised myself by being willing to try. However, I became anxious after hearing two guys at the base arguing about whether or not it could be done safely without a rope. John, on the other hand, was undaunted and calmly said “Come on Jean” and we proceeded to climb up. Long story short, I was very nervous the entire time but I did manage to get to the top and back down again in one piece. Looking back I can see that the experience should have bolstered my self confidence but at the time I still saw myself as a wuss, especially compared to John, because once we reached the bottom I freaked out and had to console myself with some chocolate. But after my Chimney Top Rock experience it was quite a while before I had another opportunity to really challenge myself. 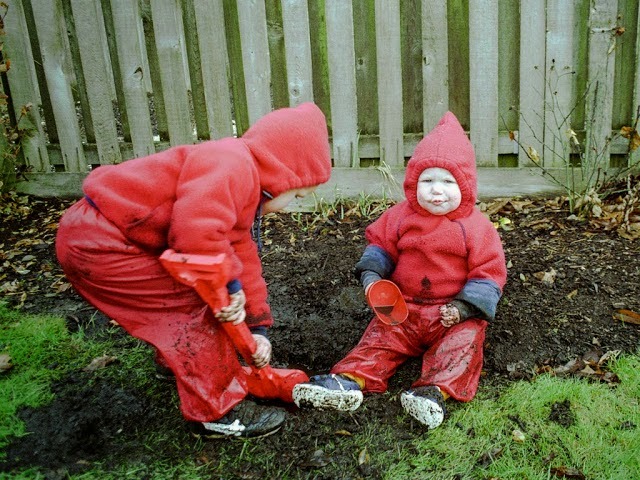 I suppose it could be said that making the decision to become a parent was challenging and that it took grit to raise two boys but I think it had more to do with irrational instinct than anything else. 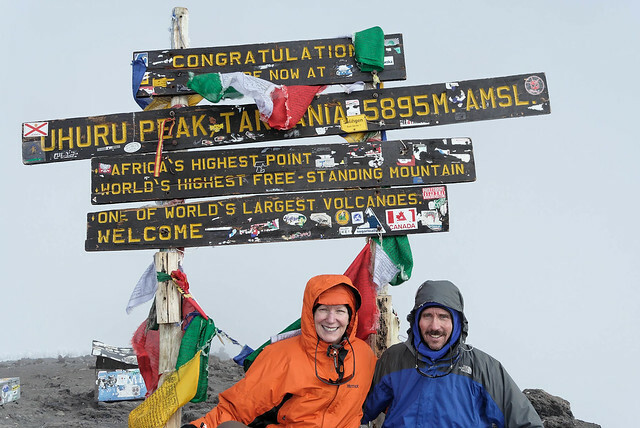 In fact my next real opportunity didn’t come until 2007 when John and I went to Tanzania with REI Adventures with the goal to climb Mt Kilimanjaro. I had trained as best I could for this trip but I was too aware that we, at 53 and 54, were the oldest people in our group. 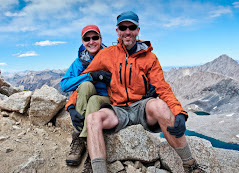 John was an experienced mountaineer and more fit than I was so he was confident in his abilities but I had a deep seated fear that I would always be bringing up the rear. Fortunately our pace and daily elevation gain was modest for most of the trek so I had no trouble. However, things got challenging when we hiked up the last 4,000 feet to the summit. It was steep, it was dark and it was very cold. I lost track of where the other members of our group were but near the top after the sun came up I realized that it was Kevin, a very fit 40 something, John and me in the lead. Then John stopped to wait for our guide who was carrying his pack in order to retrieve his camera. Shortly after that Kevin needed to step off the trail to deal with a gastrointestinal issue. So I continued on alone and was the first of our group to reach the summit. It was a huge confidence booster. 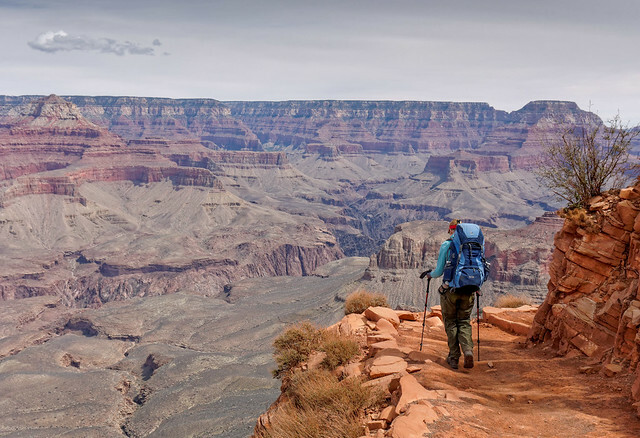 Ever since John retired and we started traveling fulltime I have had additional opportunities to be challenged especially while backpacking in Grand Canyon. 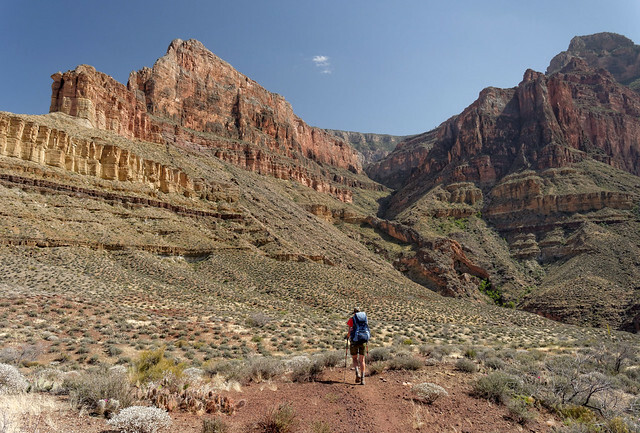 Hiking in Grand Canyon is unlike hiking anywhere else. 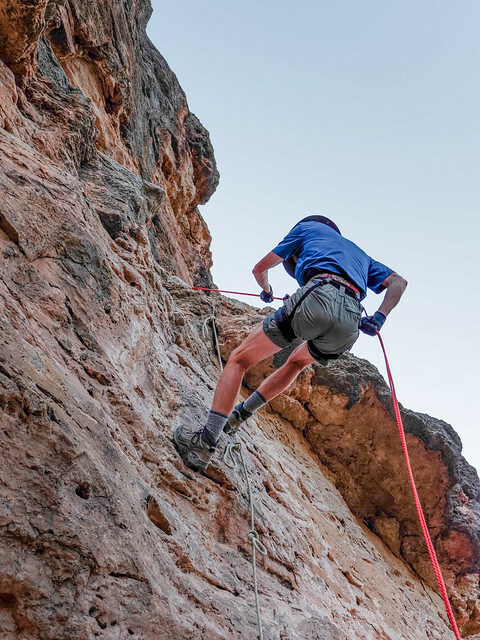 It is like climbing a mountain in reverse with the most challenging portion, the elevation gain and the altitude, coming at the end when one is most tired. 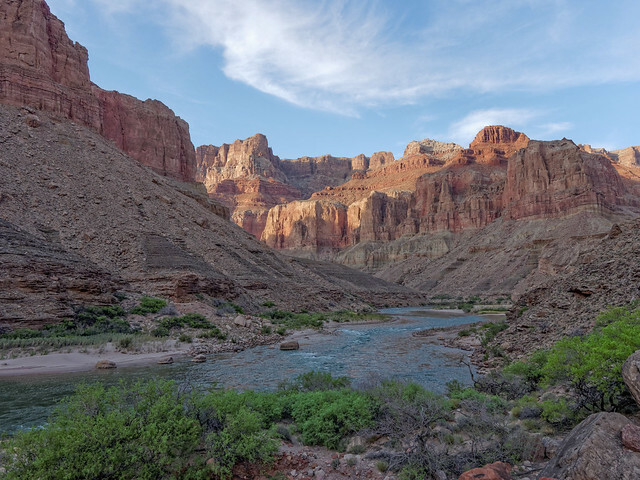 Then there is the heat; temperatures within the canyon can be 20 degrees higher than on the rim. 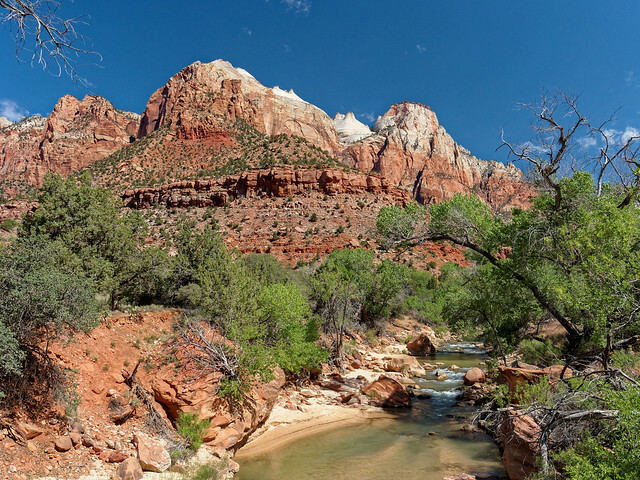 In addition the trails vary greatly in quality and the Park Service has designations for all of the trails within the park. The “Corridor Trails” are the best maintained, usually have drinking water as well as toilets and emergency phones available at intervals. 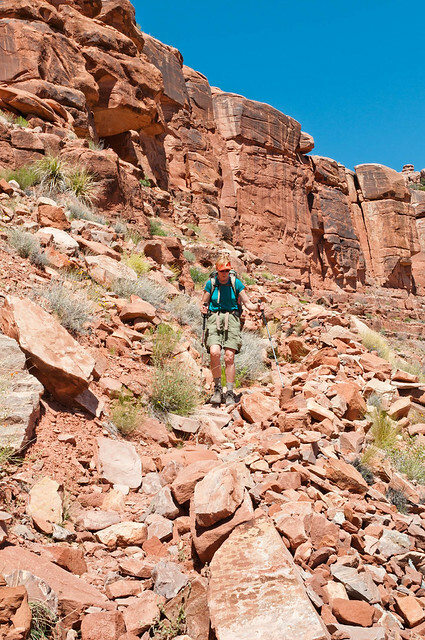 They are the most popular and are recommended for inexperienced canyon hikers. 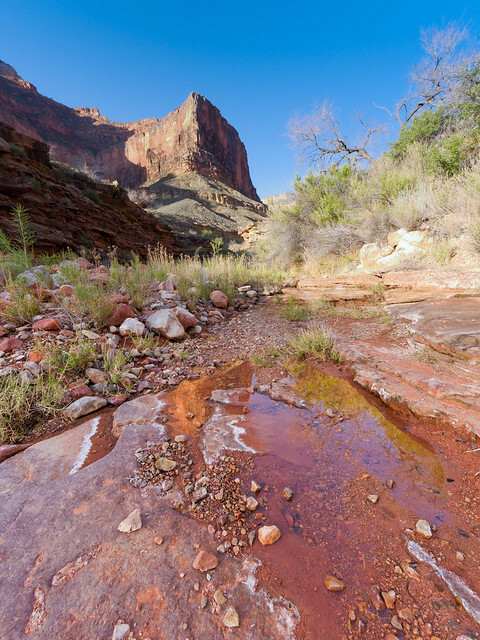 The “Threshold Trails” lack potable water, are less well maintained and have potions that are steeper and looser but are well marked and less crowded. The next are the “Primitive Trails”. 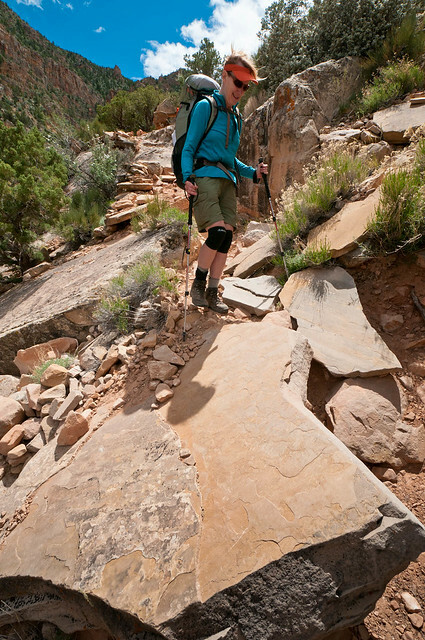 Typically these trails are more remote, not maintained, have more portions that are steep and loose plus they may have some significant exposure where a slip would mean serious injury or even death. Lastly there are the “Routes”. 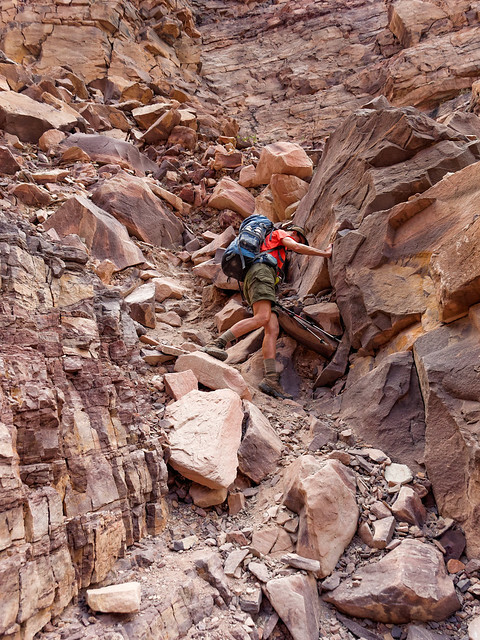 In addition to the hazards of the Primitive Trails there could be route finding issues and additional skill needed. 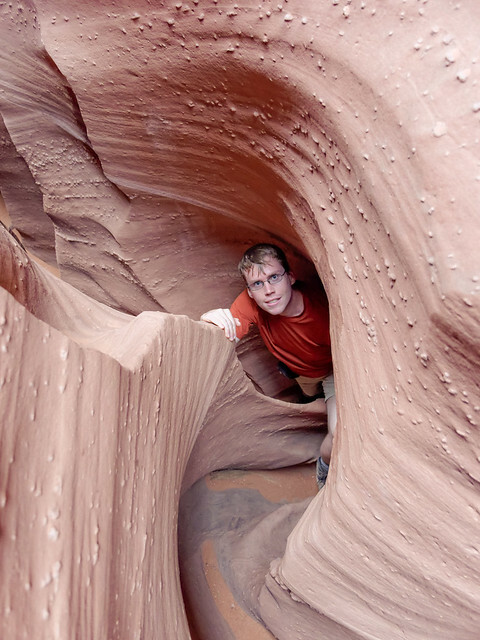 Back in 2011 we wanted to do a backpack trip in the canyon with our son Dan. 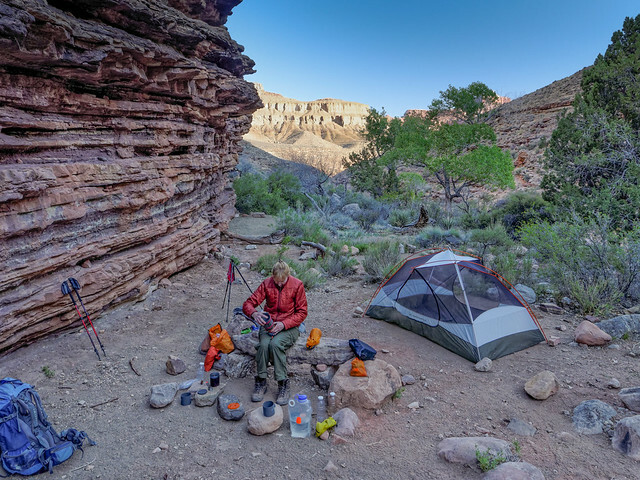 John put together a 4 day/3 night trip descending on the Tanner Trail to the river and following the river downstream on the Escalante Route. 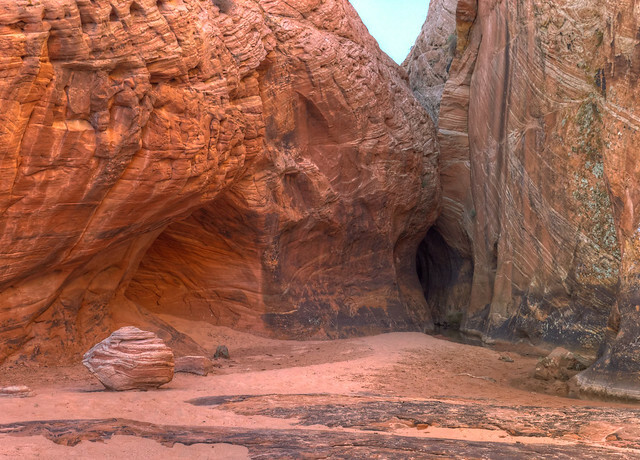 The Park Service has designated the Tanner Trail as a “Primitive Trail” and the Escalante as a “Route” and doesn’t recommend either for inexperienced canyon hikers which by NPS standards we were. This made me nervous. We would ascend back to the rim 11.4 miles on the Tonto Trail (“Primitive”) and the Grandview Trail (“Threshold”) and when John applied for the permit the Park Service strongly encouraged us via a form letter (AKA the "You're going to die" letter) to take the shorter New Hance Trail out of the canyon. The letter stated that trips such as the one we had planned “too often result in injury” and “occasionally even death”. John remained confident but I was even more nervous. The Park Service provides trail descriptions for every trail within the park so I read the pertinent ones. I wasn't very far into the description of the Tanner Trail when we started calling these write ups "Worry Papers". 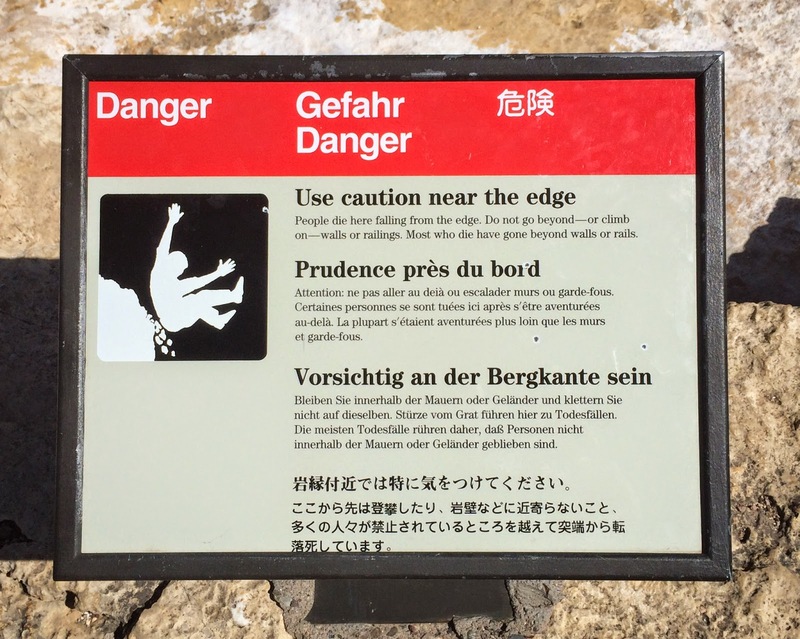 They said things like "The upper section of the Tanner Trail is narrow, badly eroded, and can be difficult to follow" … and "some slipping and sliding is inevitable and a serious fall is a real possibility". 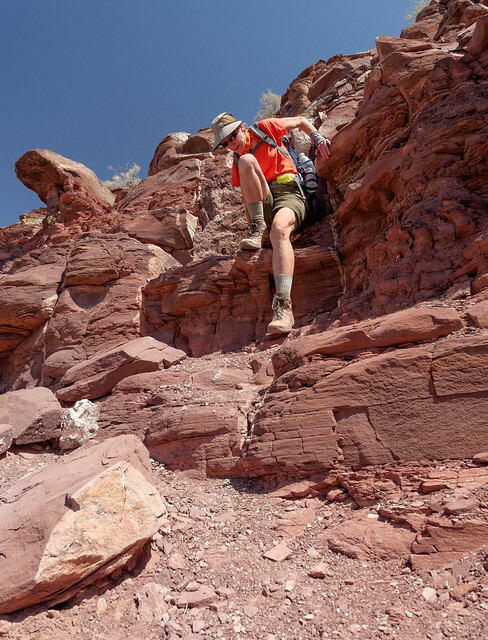 Moving on to the Escalante Route Worry Paper I read that there "are many places where you will want to avoid a misstep at all cost" and "some sections offer a walking surface about a boot-sole wide while traversing slopes that fall steeply away for hundreds of feet". 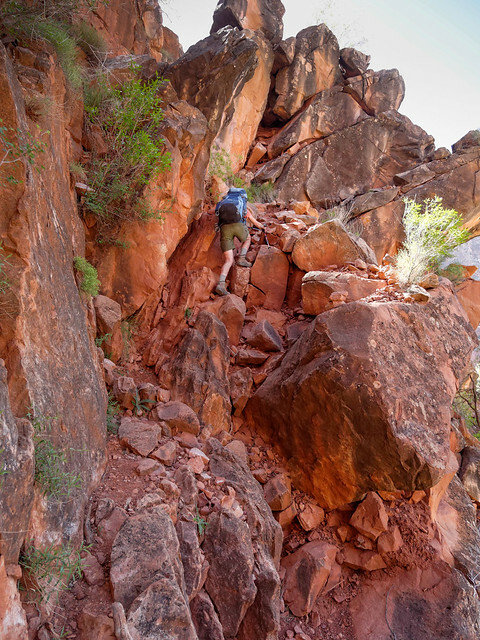 … and descending through a gully that is "steep, with lots of big boulders in precarious balance". But despite the dire warnings we completed the trip without incident and had a great time. 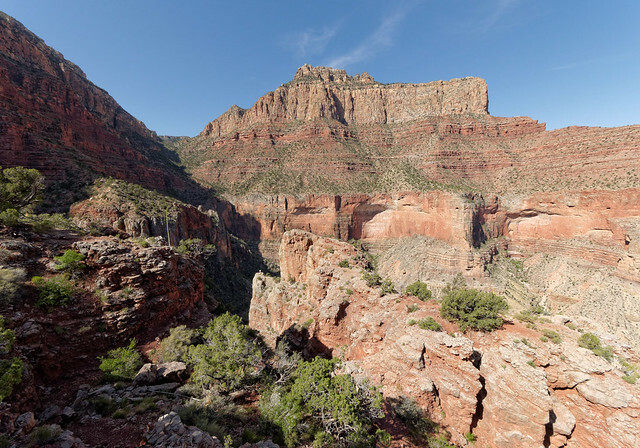 Our next backpack trip in the canyon was from the North Rim. 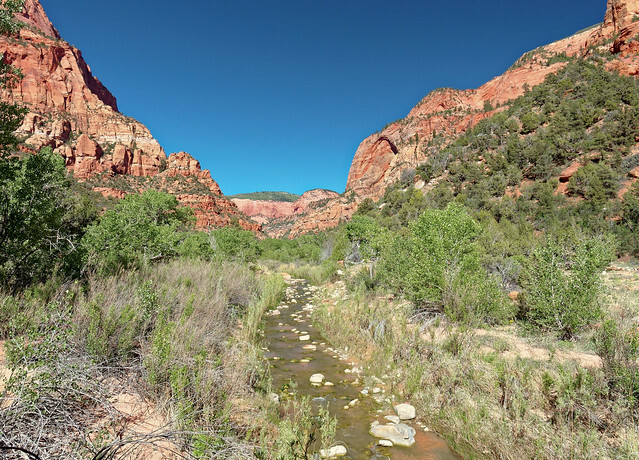 John and I did a “lollipop” loop on the Thunder River Trail to Tapeats Creek and then down the river to Deer Creek. 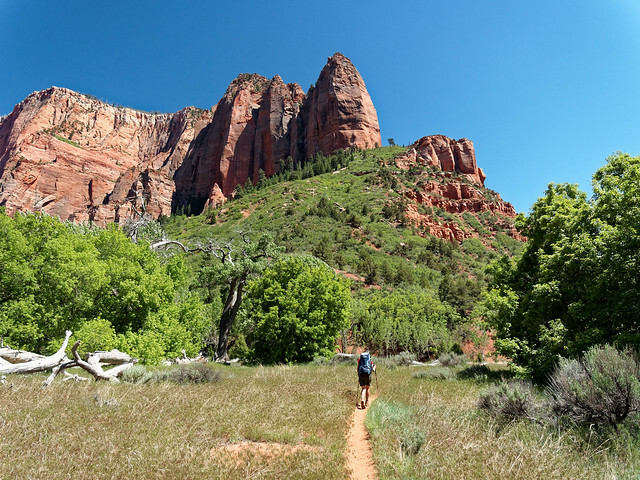 We decided to shave off 2.4 miles by taking the steeper Bill Hall Trail (a “Primitive Trail”) down to the junction with the Thunder River Trail. 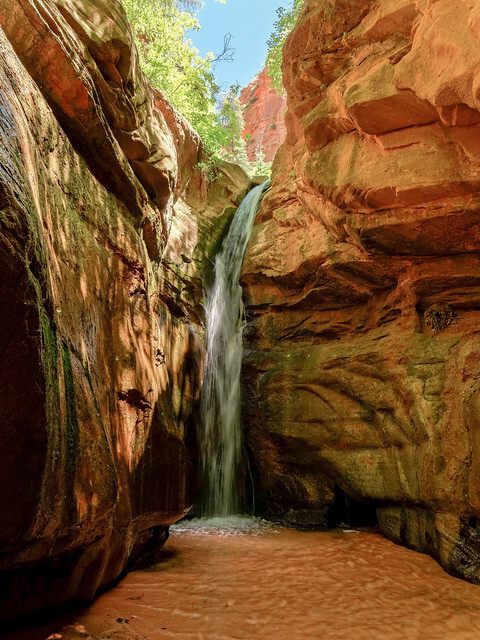 It’s listed as a “Threshold Trail” and the Thunder River and Deer Creek Trail description says things like “The descent is long and rough and the southern exposure makes the entire area infamously hot”. We took it to our campsite on Tapeats Creek and the next morning we would hike down the creek to the river. The Trail Description indicates there is a perfectly fine trail on the other side of the creek. Unfortunately the water level was too high for us to cross the creek safely and get to it so we were forced to use the "sketchy, seldom used trail that stays west of the creek all the way to the river”…This trail is described as “narrow and exposed and should be used only as a last resort". It was slow going but fortunately we reached the river without any problems. 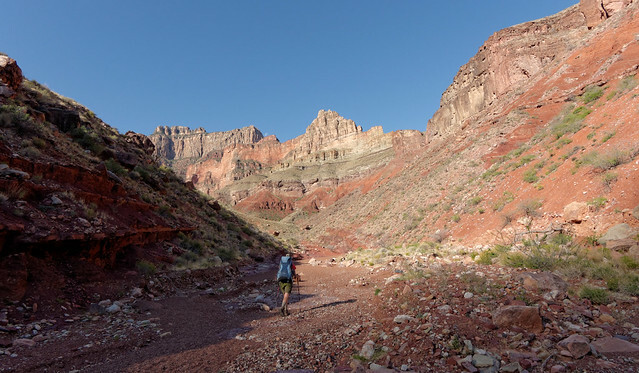 Our destination for the day was Deer Creek and the way one gets there from Tapeats Creek is by going down river on an “informal trail" that ascends a "steep, decomposing face to the top" and traverses an "outcrop to the precarious descent back to river level". We did find the route to be challenging but primarily due to the heat. It was the end of May and there is almost no shade on the north side of the river nor is there any access to water. 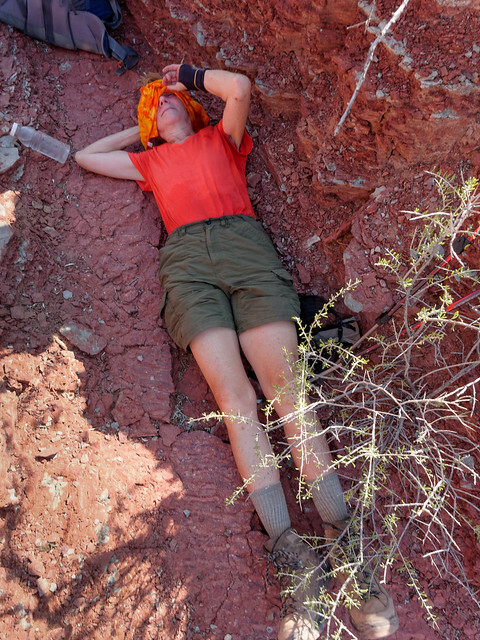 We became like desert creatures and sought any bit of shade and did not hesitate to crawl under rocks. But we made it and the following day we hiked up the “Primitive” Deer Creek Trail. 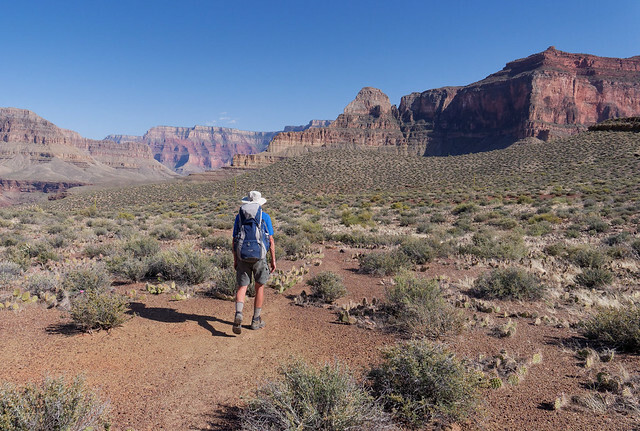 We did more backpacking in Grand Canyon in April of 2013 including a bit on the Tonto Trail, a “Primitive Trail” that is described as "a rough, unmaintained wilderness route". 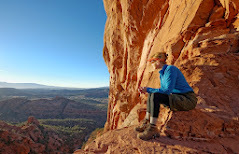 We hiked on the Hermit Trail, a “Threshold Trail” with some "uncertain footing as well as the impression of exposure". We also did the Royal Arch Loop, a “Route” which, according to the Worry Paper, is "considered by many to be the most difficult of the established south side routes" and for "those lacking the required skill and judgment this hike offers about a million ways to get into serious trouble". This route has a 20 foot rappel and as I had never rappelled I was nervous about it. Fortunately John had enough experience to set it up and he was able to coach me. Once past the rappel the down climb was still a bit challenging but we completed the entire route without getting into any trouble. 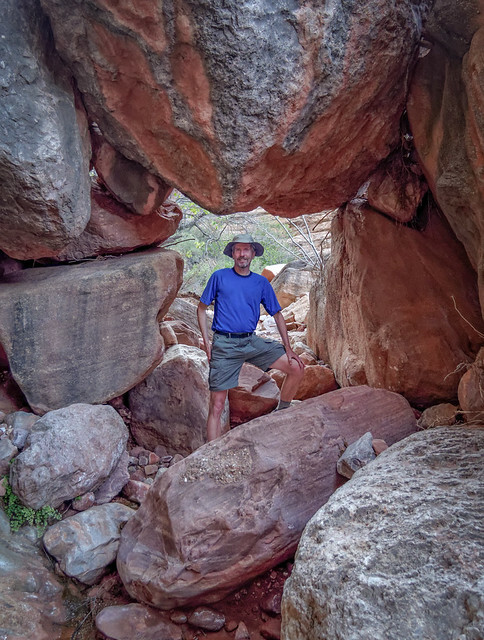 Our last trip that year involved hiking nearly a week on the Tonto West Trail which is described as "notorious” and is “regarded by canyon experts as the most difficult and potentially dangerous section of this long trans canyon trail system". This is due to the fact that there are "no reliable water sources" and the "complete lack of bail-out routes to the rim". We did find the lack of water a bit challenging. At one point we each needed to carry two gallons of water (16 additional pounds) to see us through to the evening of the following day and we had to ration our water carefully to ensure it would last. But we survived and it has become one of our favorite trips. 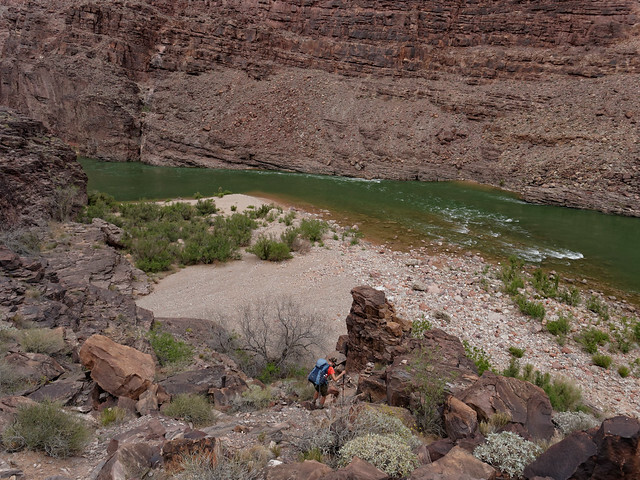 In April 2014 we reached the point where there were three “Primitive” trails that we still needed to do to complete our goal of hiking every trail in the park between the South Rim and the Colorado River; the Beamer, the New Hance and the Boucher Trails. 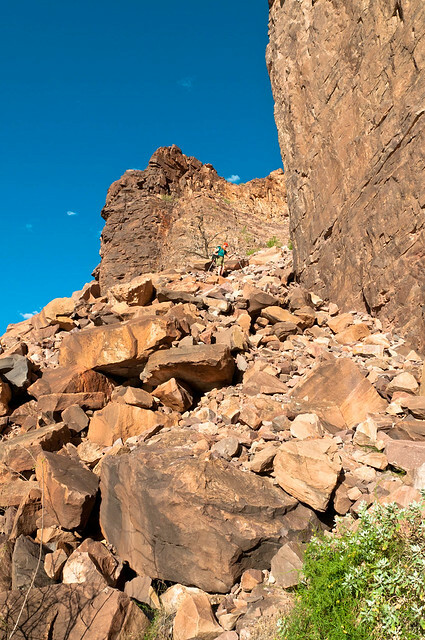 The Beamer Trail Worry Paper describes portions as a "tedious, demanding trek along narrow, exposed ledges at the very brink of high cliffs" that are "badly eroded, narrow, and, in places, remarkably exposed at the edge of an impressive precipice". The Boucher Trail Worry Paper debates that by saying it is "arguably the most difficult and demanding of all of the south side trails". 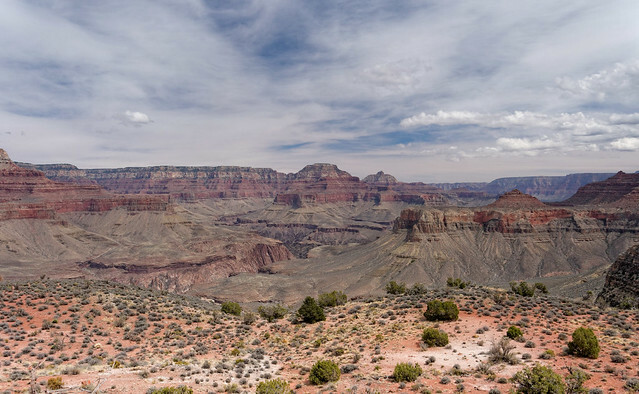 Having now reviewed all that we have done in Grand Canyon (and looking at all of the photos of really crappy trails) I do feel proud of our accomplishment. In fact I am now willing to say “I got grit”. Most importantly I am willing to believe it. 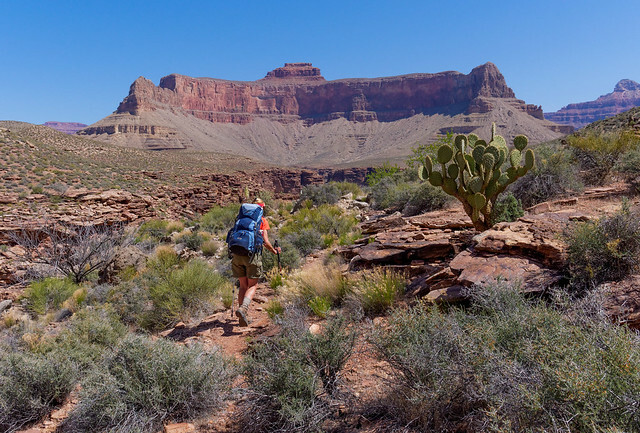 However, one does not have to backpack on the “Primitive Trails” or “Routes” scrambling over rocks or skirting precarious ledges to gain some grit in the Grand Canyon. 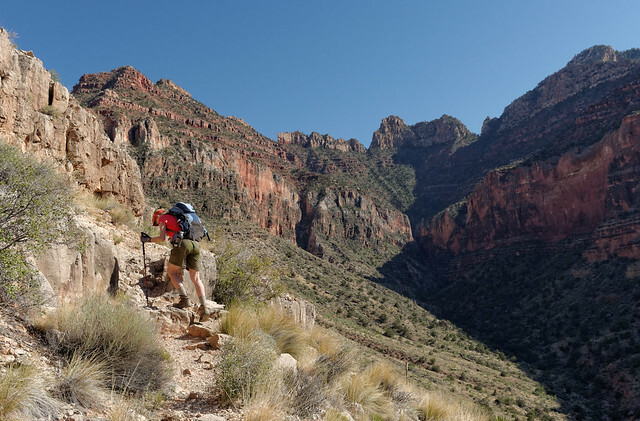 The “Corridor” and “Threshold” trails are plenty challenging and provide ample opportunities. 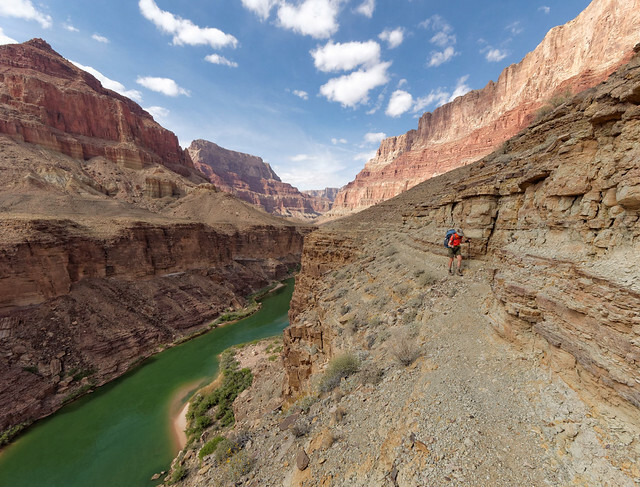 Unfortunately not everyone who hikes in the canyon is prepared for that challenge. 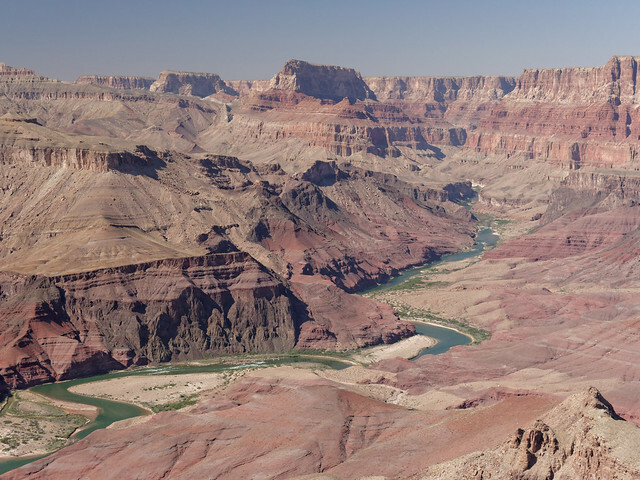 Many visitors to the park understandably want to get below the rim and many of those are determined to get as far as the river. 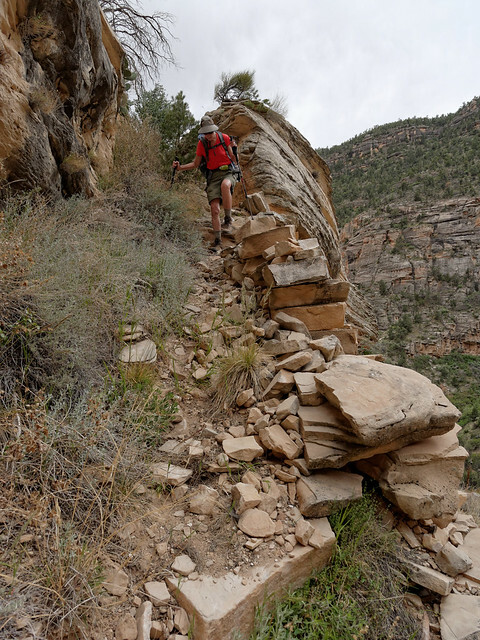 So they start down one of the Bright Angel Trail or the South Kaibab Trail, both "Corridor Trails”, in the cool of the morning and have no trouble covering several miles on these well maintained trails. However, once they turn around to head back up they are zapped by the incline, the heat and the altitude. As a result the National Park Service does about 300 rescues per year. … something that is definitely not hard to do (especially for young males). 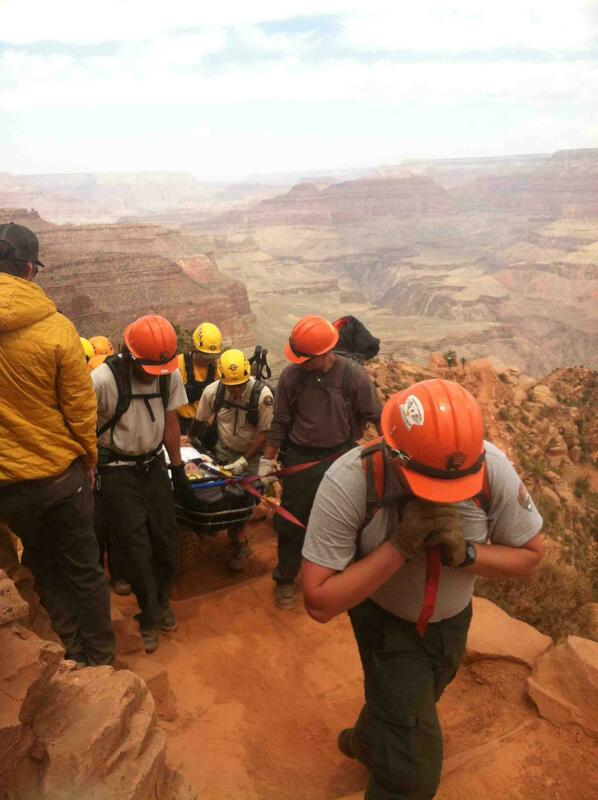 But many focus on concerns about the heat as 80% of rescues done by the NPS are due to heat related issues. 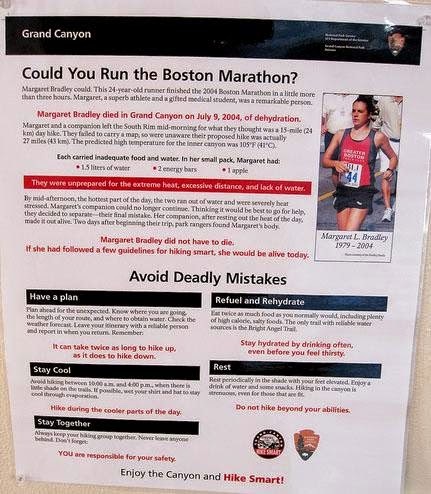 The most poignant is the one about Margaret Bradley, a 24 year old Boston Marathoner, who died of heat stroke while trail running in the canyon back in July 2004. 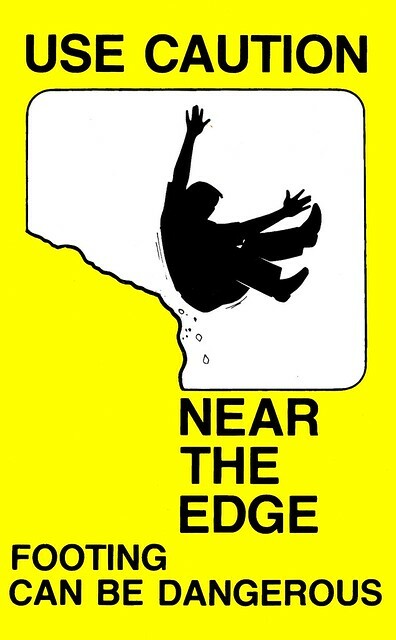 Her tragic story is told in a Backpacker Magazine article titled "A Dozen Ways to Die". Others are less grim but equally informative. However, of all of the signs we have seen this one is our personal favorite. Still others seem unprepared for the varying quality of trails. 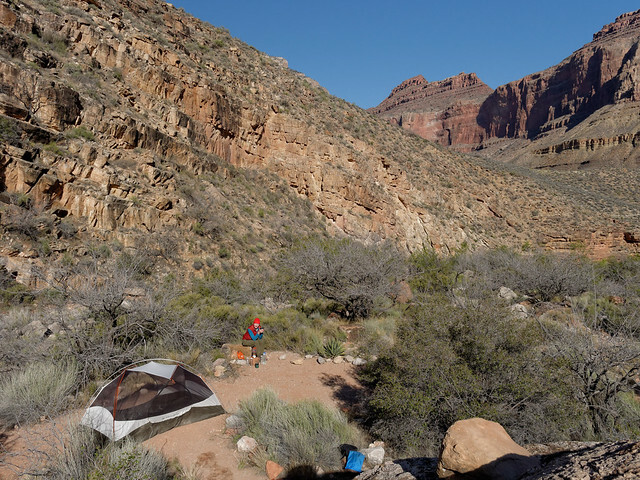 Last spring when we were hiking up the Grandview Trail we encountered a group of teenage girls heading down who were planning to camp out on Horseshoe Mesa. We were approaching the end of our trip. I was tired and focused on putting one foot in front of the other so I was surprised when one of the girls stopped directly in front of me. I had been looking down at the trail and the first thing I saw was her bright purple running shoes. When I looked up I took in her lovely long blond hair and carefully made up face. I then noticed that she looked rather distressed. As soon as I made eye contact she anxiously demanded "does the trail get better or does it stay this bad?" This question took me aback as I had just been thinking that this particular section was pretty good. The incline was more gradual than it had been and there was way less loose rock. So I wasn't sure how to answer her. The best thing I could think of on the spur of the moment was to say "well, it changes". 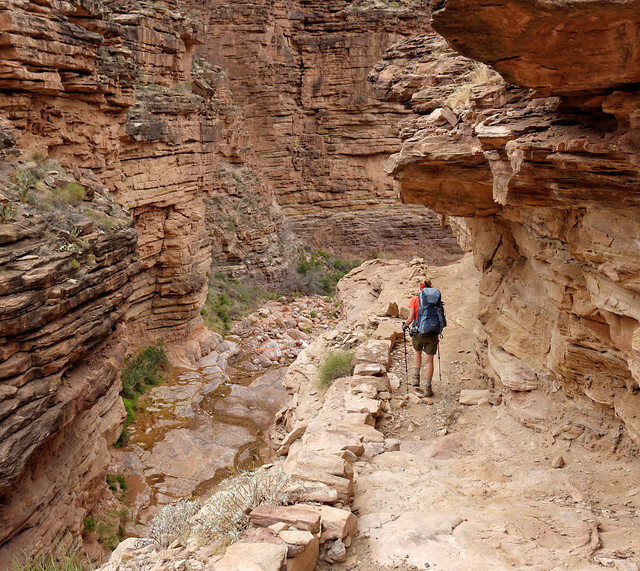 And then last April while descending the Tanner Trail we encountered another person who seemed out of their depth in the canyon. I was a bit ahead of John when I encountered two couples who were also heading down but stopped for a break. I said hi and kept going. 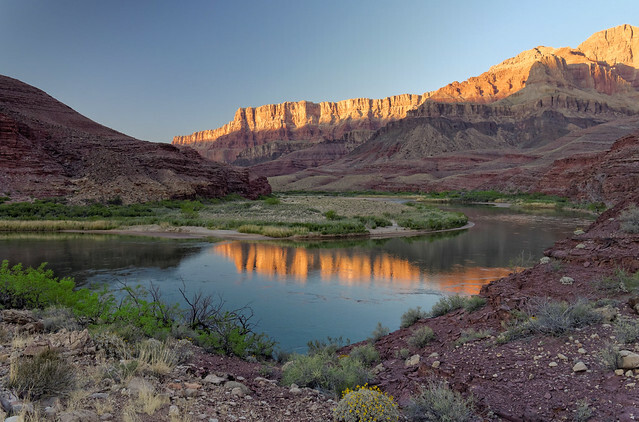 However, John did stop to talk to them and discovered their plan was to camp at Tanner Beach and then head down the river on the challenging Escalante Route, a trip we have done before. He also learned they were stopped because one of the women was having an anxiety attack. When I heard about it later I was surprised as the trail had not been exposed and there was no real danger. There had just been many step downs and some loose rock that my knees disliked. I began thinking that if she was having an anxiety attack there then she would have a lot of trouble on the portions of the trail below. 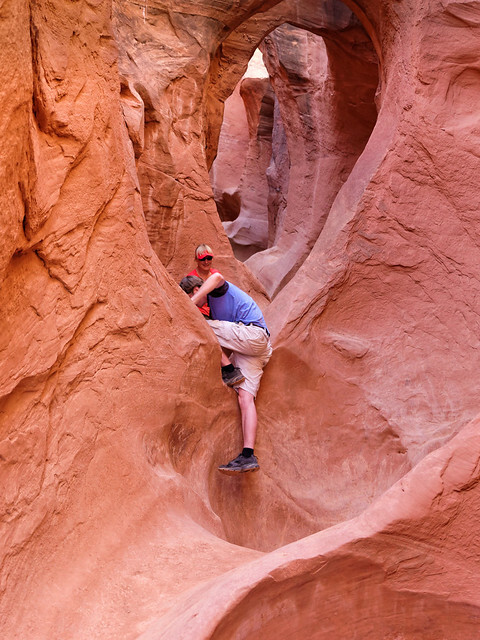 And she definitely wouldn't make it past parts of the Escalante Route. The narrow eroded sections with true exposure, the boulder filled gully and the steep ledges all came to mind. I have no idea what happened to this group as our paths did not cross again because once we got down to the river we continued upstream on the Beamer Trail. But I remained concerned about her and wished I had stopped to talk to her. 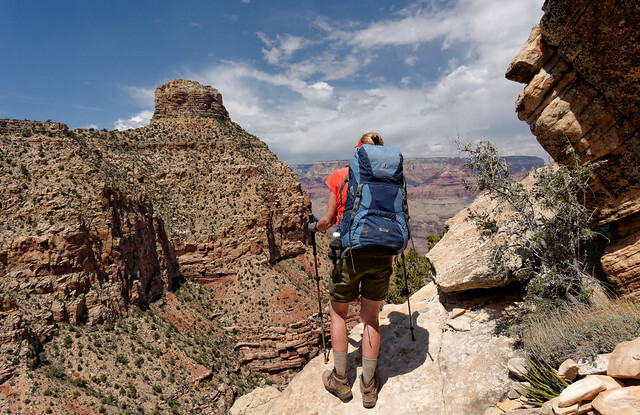 Perhaps she was just in way over her head and the best thing to do was to hike back out and try something less demanding like the Bright Angel Trail. 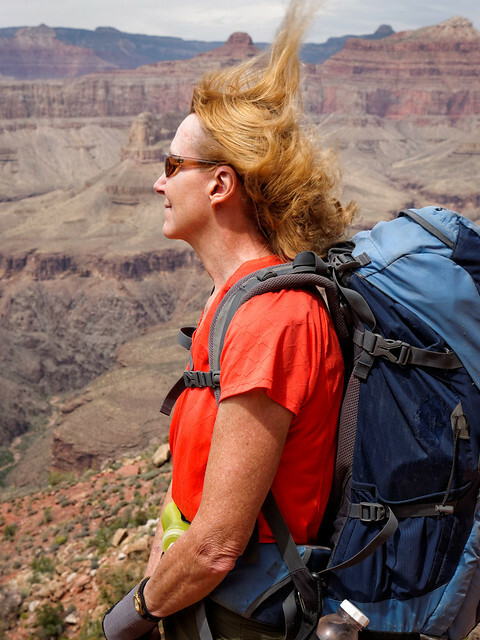 I then began to wonder if I should keep an eye out for hikers like her in the canyon who seem unprepared for the challenges ahead. Should I be ready to step in and be their advocate to help keep them from being dragged deeper into a difficult situation? But then I remembered a time when I had experienced an anxiety attack while hiking. 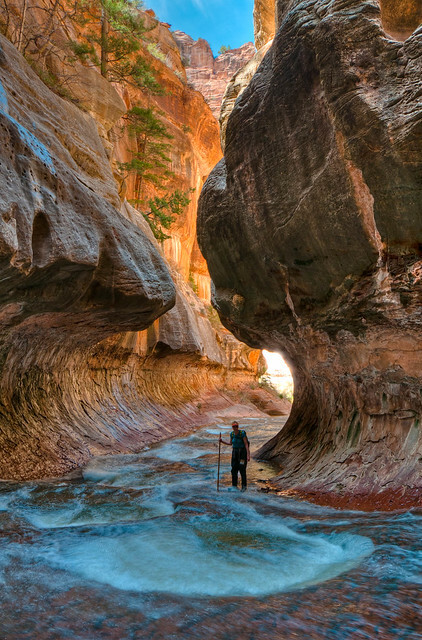 It occurred when John and I were hiking to "The Subway" in Zion National Park. 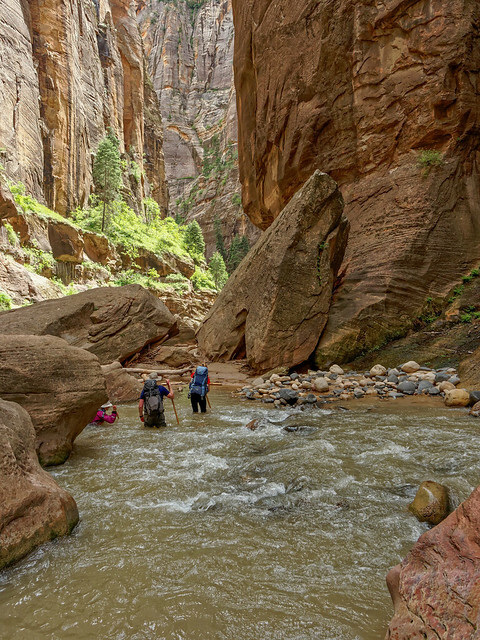 This route requires hikers to crisscross back and forth through the Left Fork of North Creek. Due to recent snow melt the level was especially high, the water was cloudy and the current was strong. The canyoneering boots I was wearing were quite large and I had trouble finding secure places for my feet on the rocky bottom. I have lousy balance and almost went down a few times. I certainly wouldn’t have drowned, I would have only filled my “dry pants” with water, but I got freaked out anyway and stopped. I didn't really want to go back but for the time being I was unable to go forward. I was stuck. John reluctantly said that if I really wanted to go back then we would. But then he said that he had confidence in my abilities and that is what I needed to hear. After I calmed down we were able to continue and I'm so happy we did. If we had turned back not only would we have both been really disappointed at not seeing such an amazing feature I would have lost a lot of self confidence not to mention self respect. What I didn't need at the time was some well meaning person telling me I should just give up. After all some stranger who just happened by doesn't know me, they don't know what I have done in the past and what I am capable of. They certainly don't know what I need at that moment. So I now realize that when I encounter someone on the trail who is struggling that I am just as clueless about them so who am I to try to discourage them? Of course I wouldn't hesitate to help someone in obvious need but who am I to try to take away someone's opportunity to challenge themselves and to develop some grit? If I say anything at all shouldn’t it be something encouraging? Such as yes, it is challenging but I know from personal experience that fatigue, fear and anxiety can be overcome and replaced by great pride in one’s accomplishment. 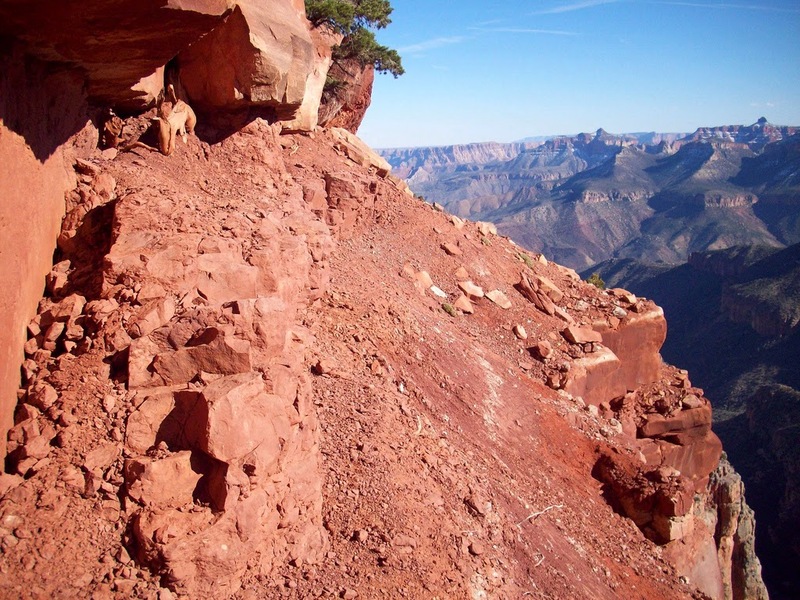 My hope is that the girls that John encountered on the Bright Angel Trail, who undoubtedly did hike out under their own power, felt a boost of self confidence in their ability to persevere. I also hope the girl I encountered on the Grandview Trail adapted to the changing trail conditions and remembered to stop periodically and look at the amazing scenery around her. I really hope that the woman who had the anxiety attack on the Tanner Trail was able to complete their trip as planned. I know from personal experience that someone who completes that trip comes out a whole lot "grittier" than when they started. … and from almost anywhere in between. 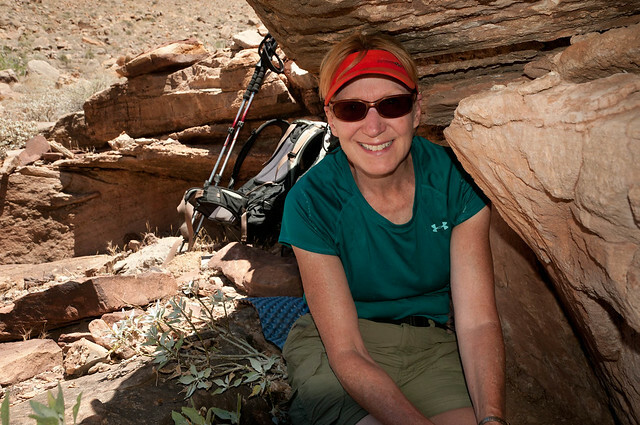 We also love how hiking in the canyon makes us appreciate simple pleasures such as a patch of shade on a hot sunny day. 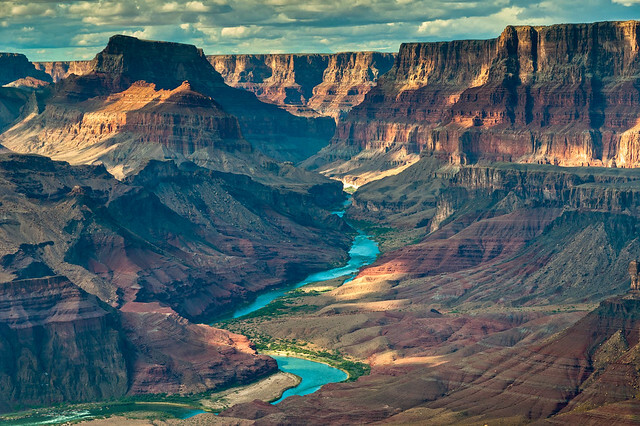 … to rivers which support a bounty of life. We especially love the solitude that is possible. Despite the vast number of people who are at the park on any given day during peak season it is possible to be places where you don't see any of them for hours, even days. 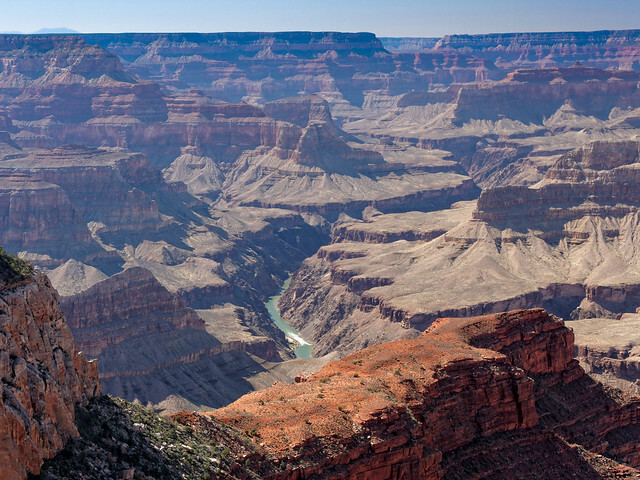 And the canyon is so huge it also provides us with a good reminder of just how small and inconsequential we humans really are in the great scheme if things. 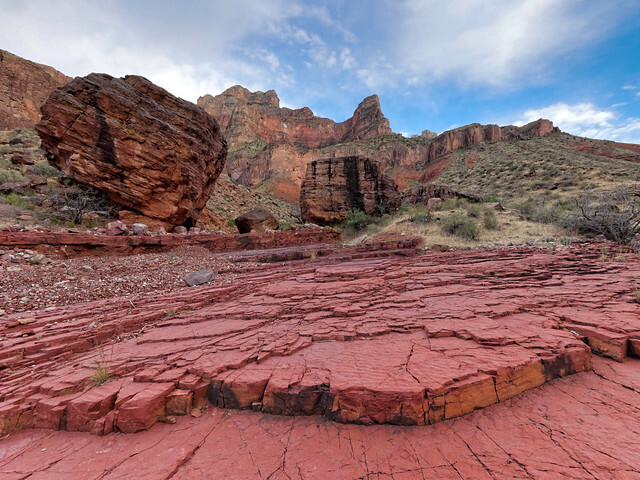 … and the Nankoweap Trail which is described as the "MOST difficult of the named trails in Grand Canyon". Well, all I can say is it's a good thing I got grit because I think I'm going to need every bit of it. Amazing walks, amazing pictures, thanks for sharing guys, made my day!